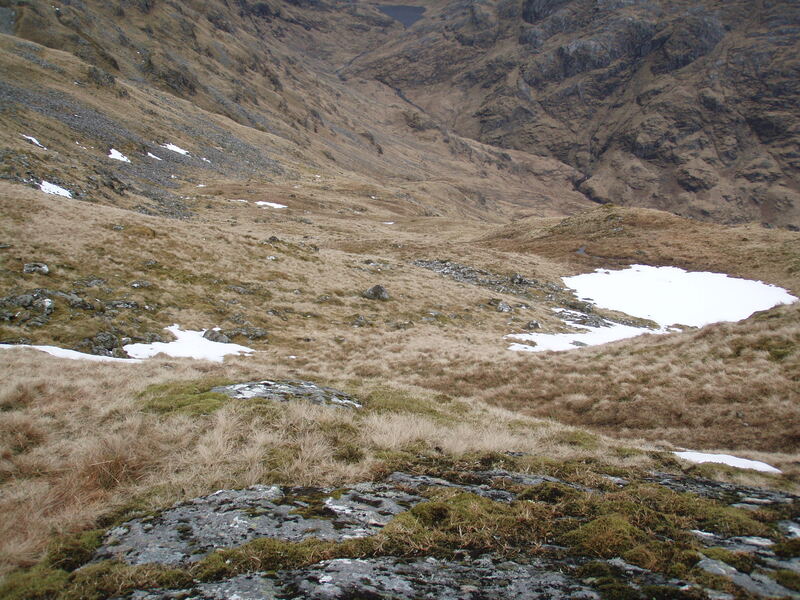 This is a trip I had planned several weeks ago, and I had only been waiting for a good weather forecast for the West Coast, and for most of the snow to disappear from the hill tops. 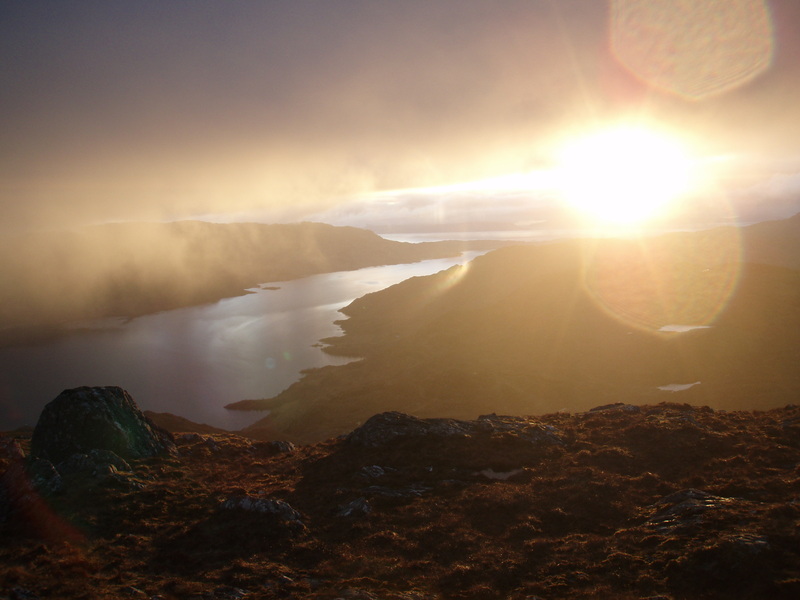 Last weekend the conditions seemed perfect, so I left Inverness for Lochailort at about 07:20 on Saturday morning. 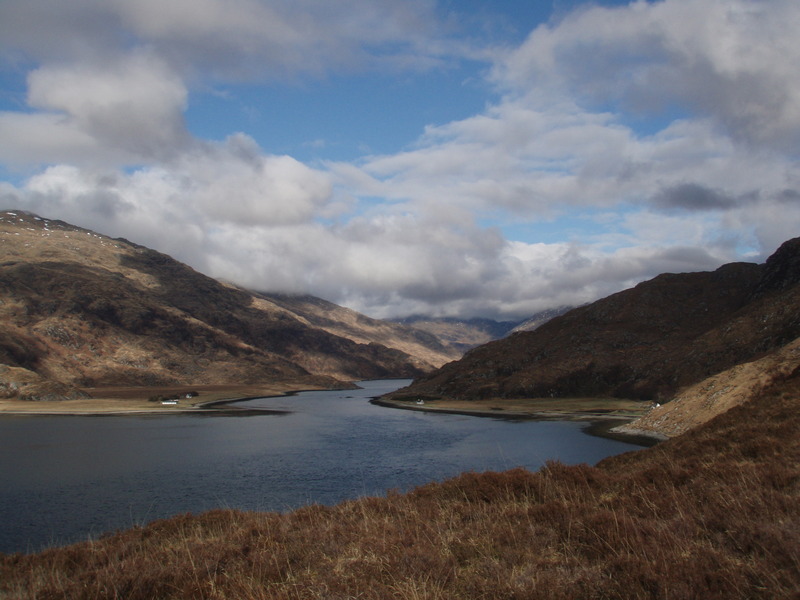 Normally the journey should have taken a bit less than two hours, but several road works on the way slowed me down considerably, and driving along the north side of Loch Eil I was having a neck-and-neck race with the train I was hoping to catch at Lochailort! 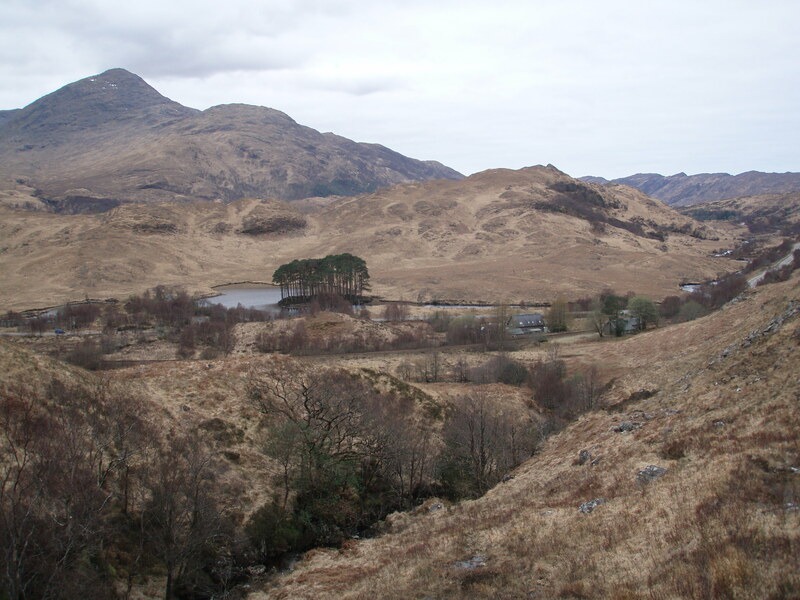 I parked at the train station, grabbed my rucksack and trekking poles, rushed onto the platform – and three minutes later the train arrived. 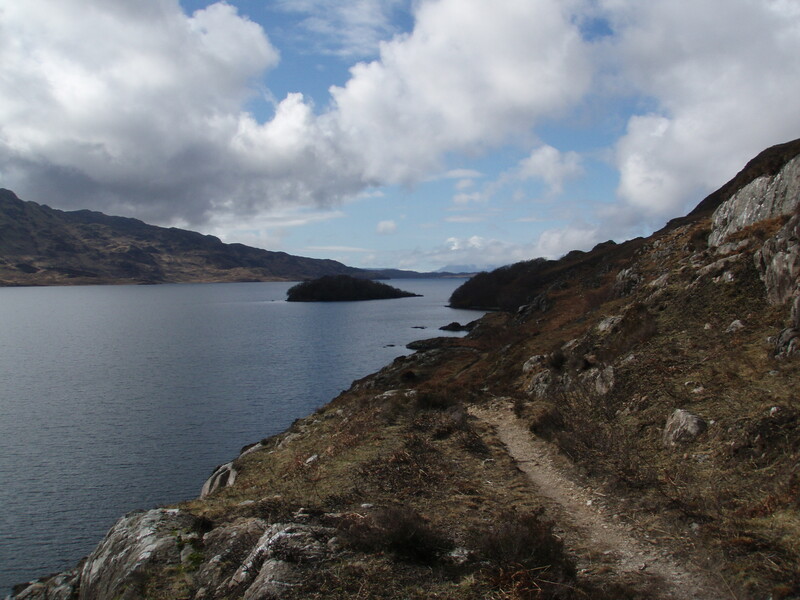 25 minutes later I got off the train at Morar and started walking on the single track road along the north shore of Loch Morar. 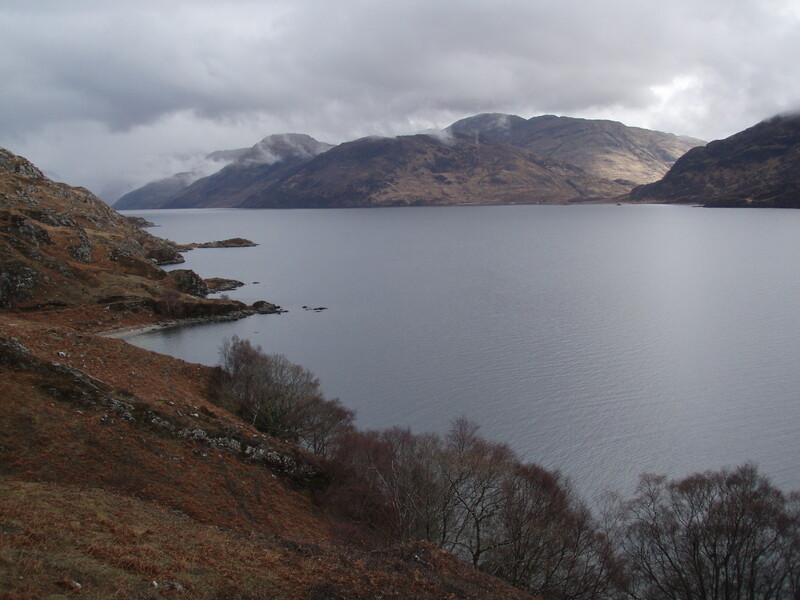 The road is very scenic, passing several bays, some with nice sandy beaches. 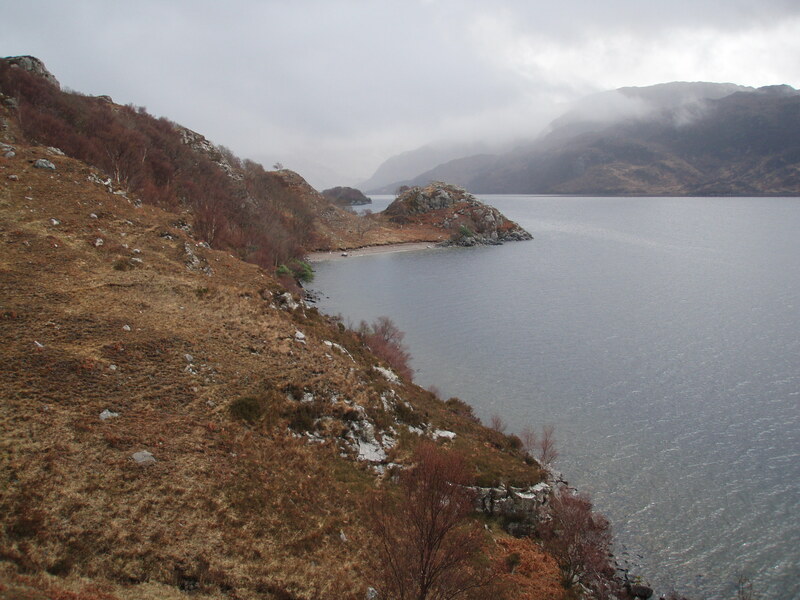 In one of the bays I met a group of sea kayakers getting ready to cross the loch. 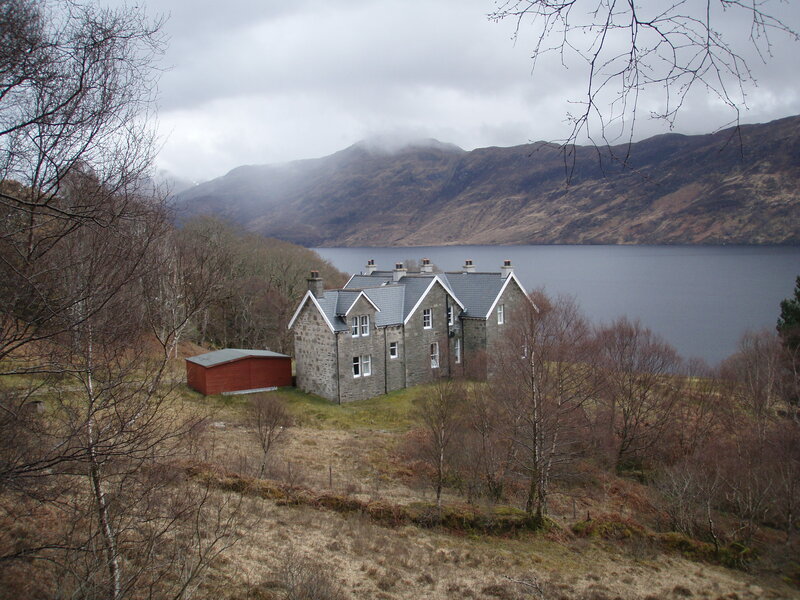 They were planning to stay at Oban Bothy that night, while I was heading there the day after. 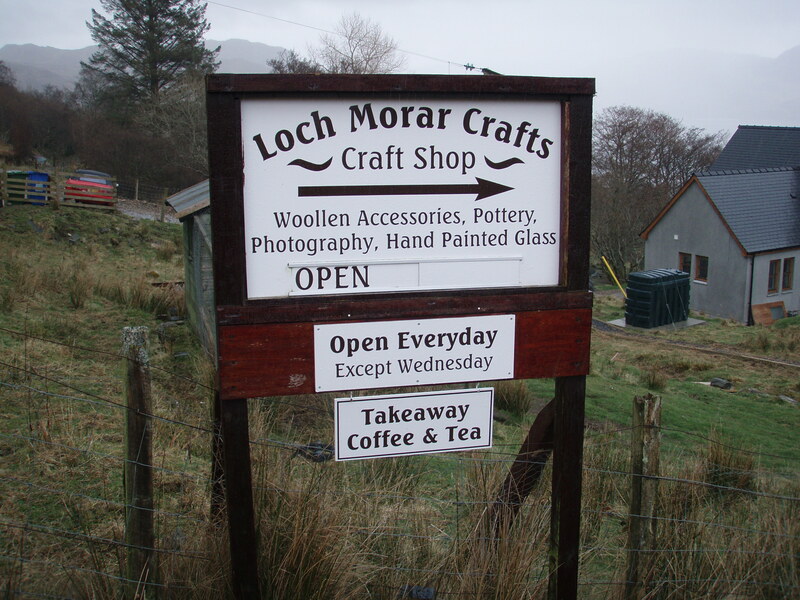 At Bracara I had a look around in the Loch Morar Craft Shop, and an interesting chat with the owner. 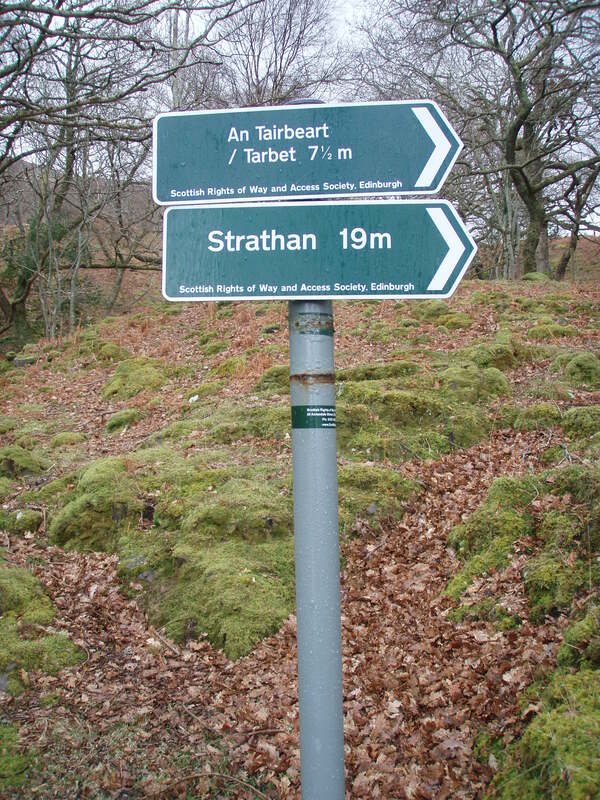 At Bracorina, the road turns into a signposted track. 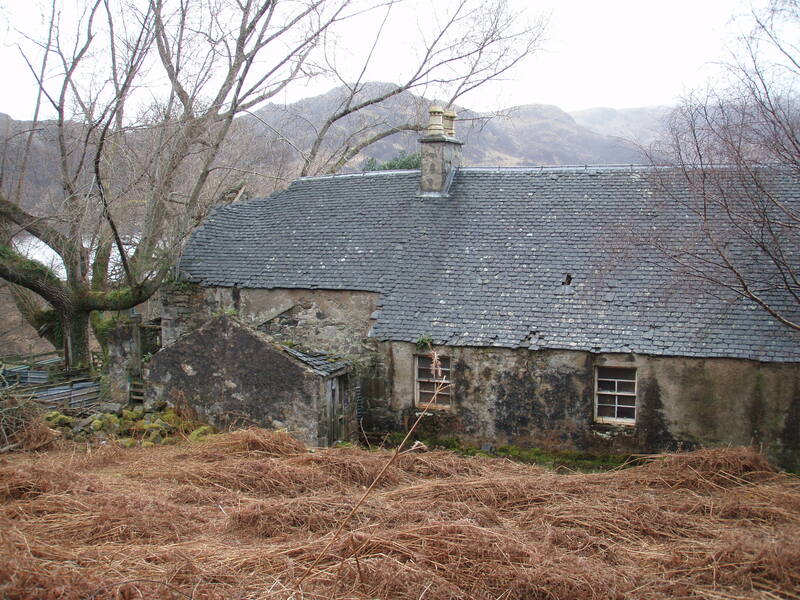 Some ruined houses along the way. 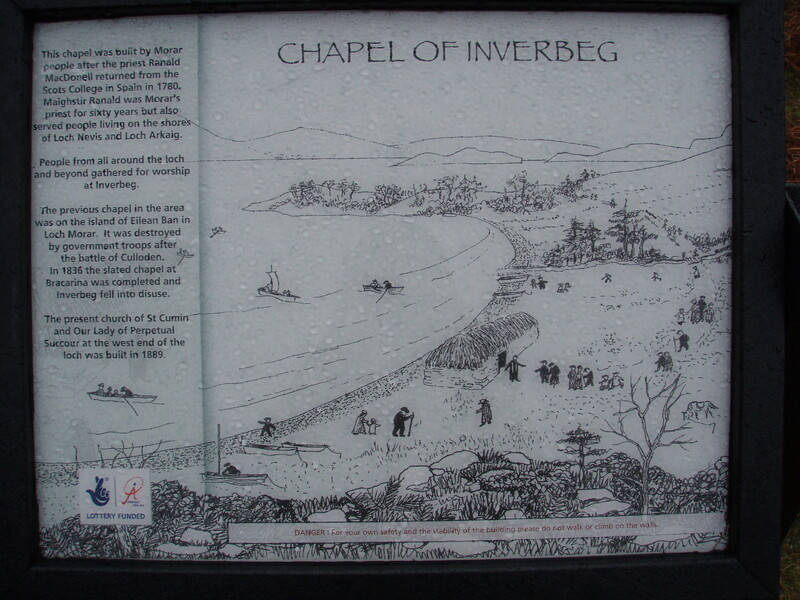 Shortly after Bracorina, the ruined Chapel of Inverbeg is reached. 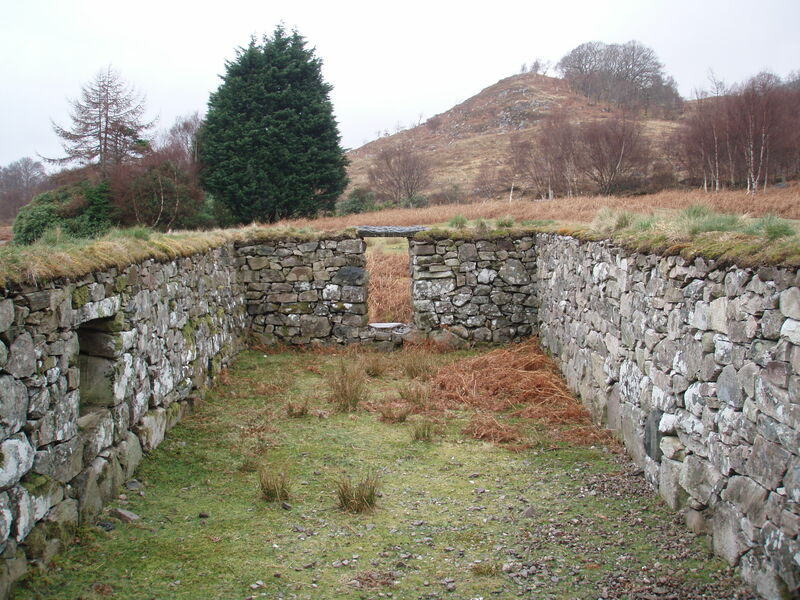 The Chapel – or what’s left of it. 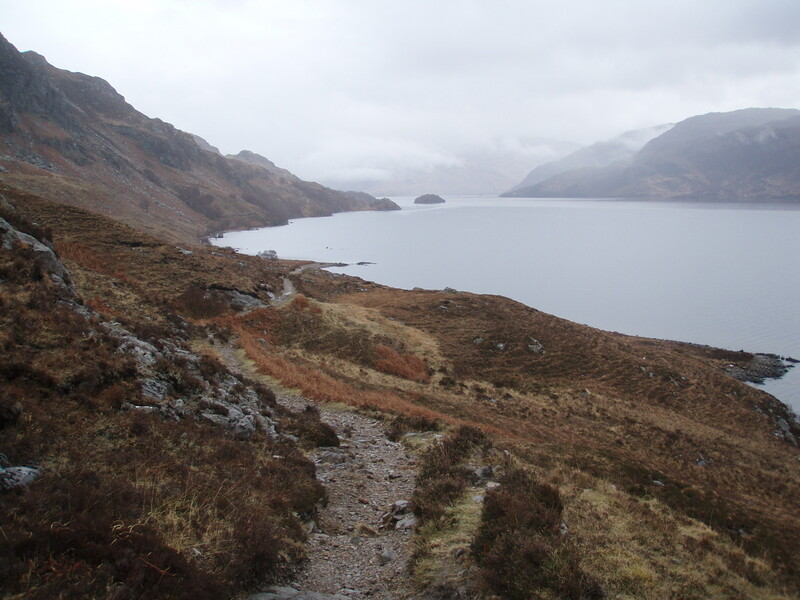 I was pleasantly surprised by the quality of the path, this is definitely the un-boggiest path I have walked in a long time! 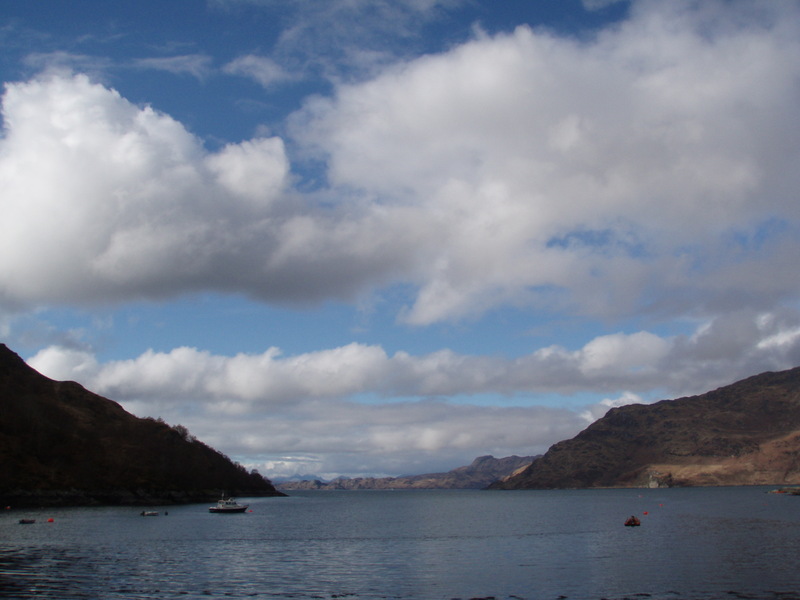 It had been raining/drizzling since I had left the Craft Shop, but now the rain stopped and the clouds began to lift. 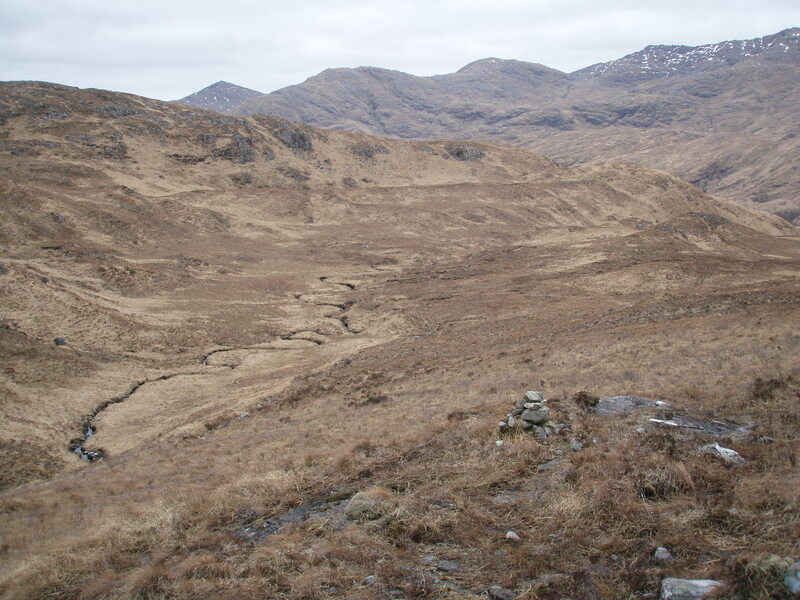 There is another ruined settlement at Brinacory. 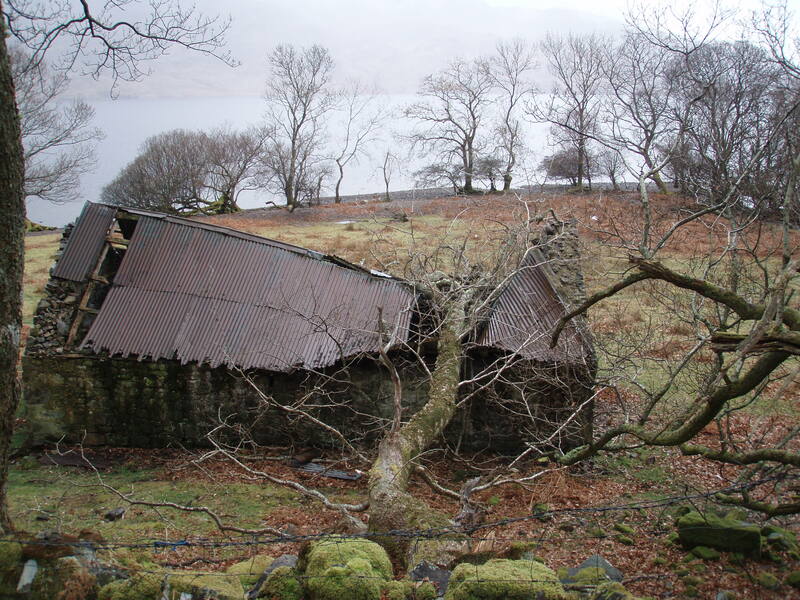 One of the farm buildings looks almost intact. 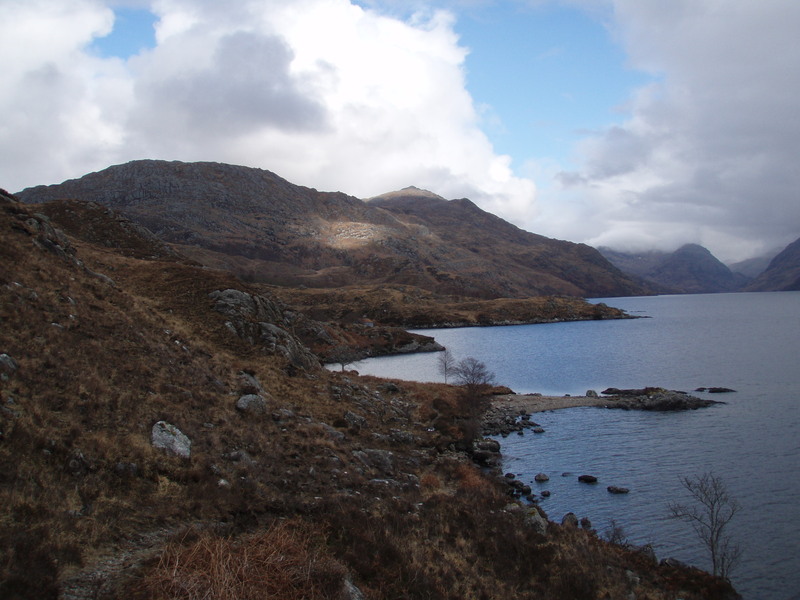 The weather was clearly improving at this point – sunshine at Meoble on the other side of the loch. 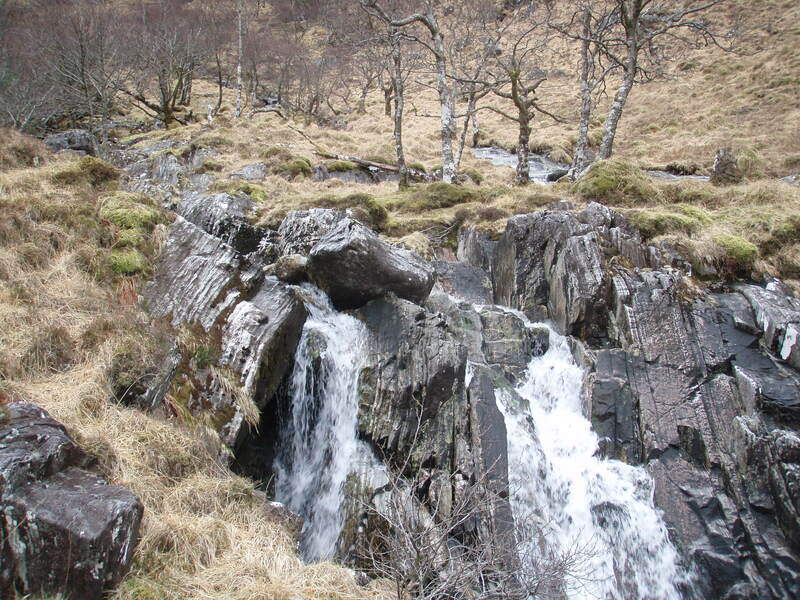 One of many potential camp spots. 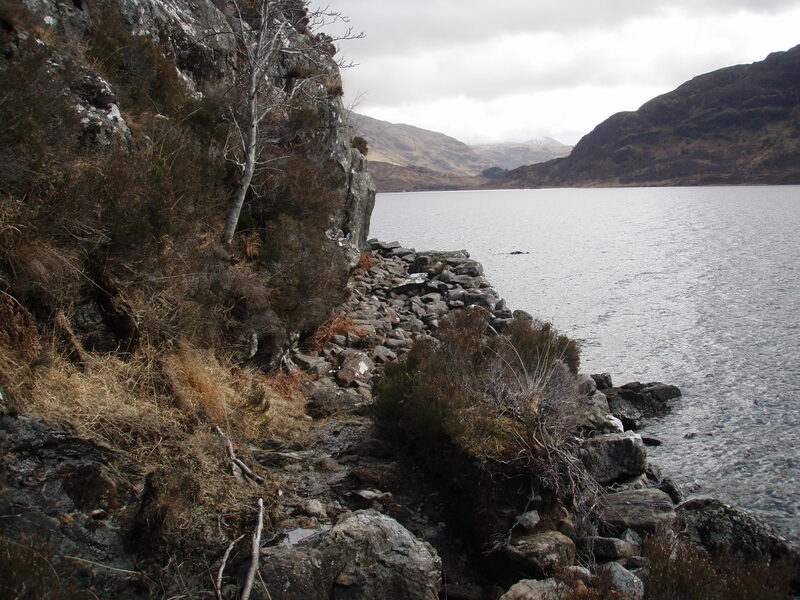 In one place, the path leads over some rocks, but apart from that it is very easy. 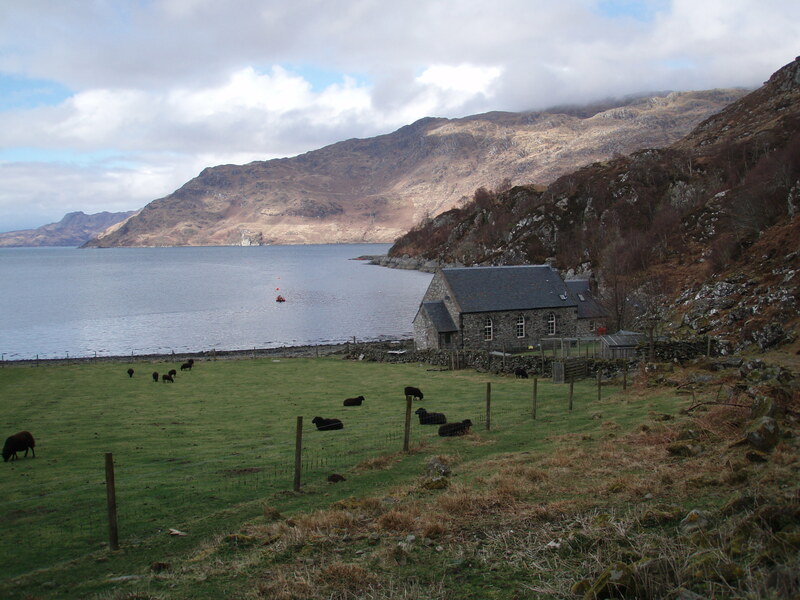 I met an elderly couple with a dog, and later on a family with two young kids, so this is certainly a nice day trip from Morar, doable for anyone. 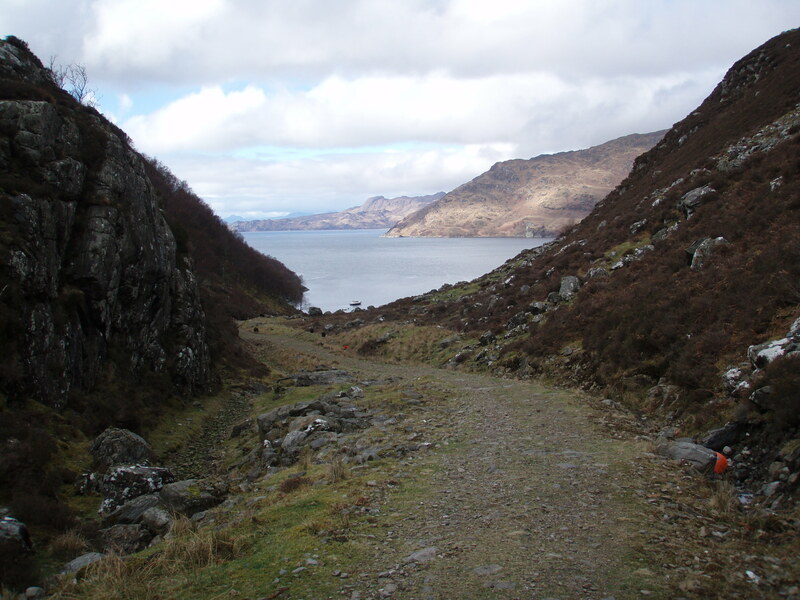 At Swordland, the path turns into a wide track which leads down to Tarbet Bay. 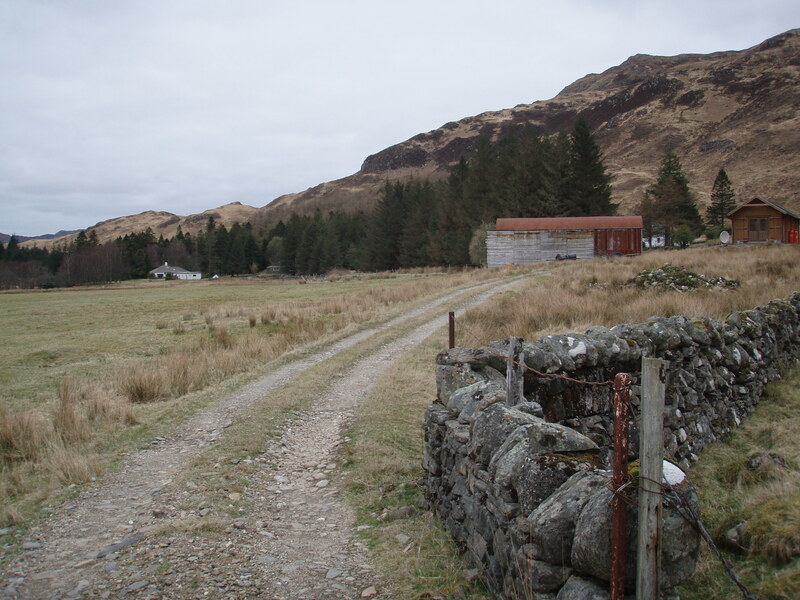 Past the bunkhouse, a path leads steeply up the hillside. 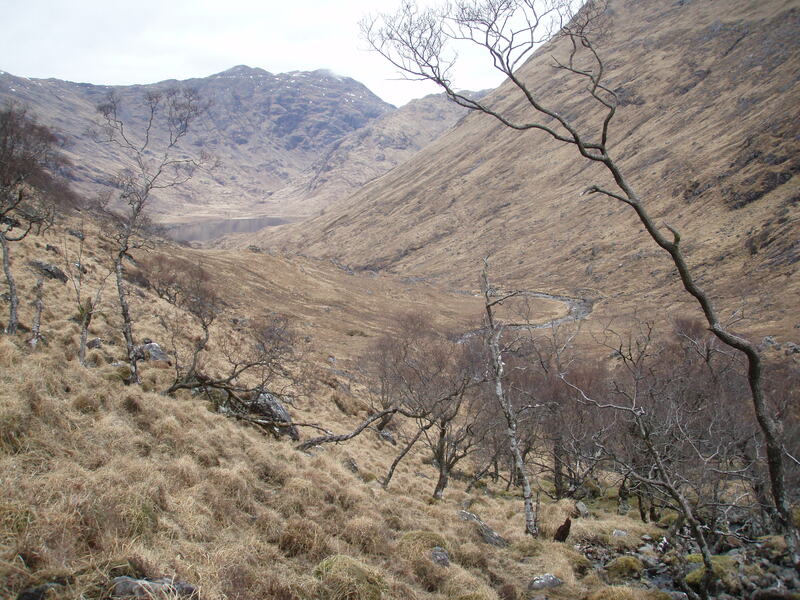 This path leads eventually down to Kylesmorar, the settlement on the right hand side. 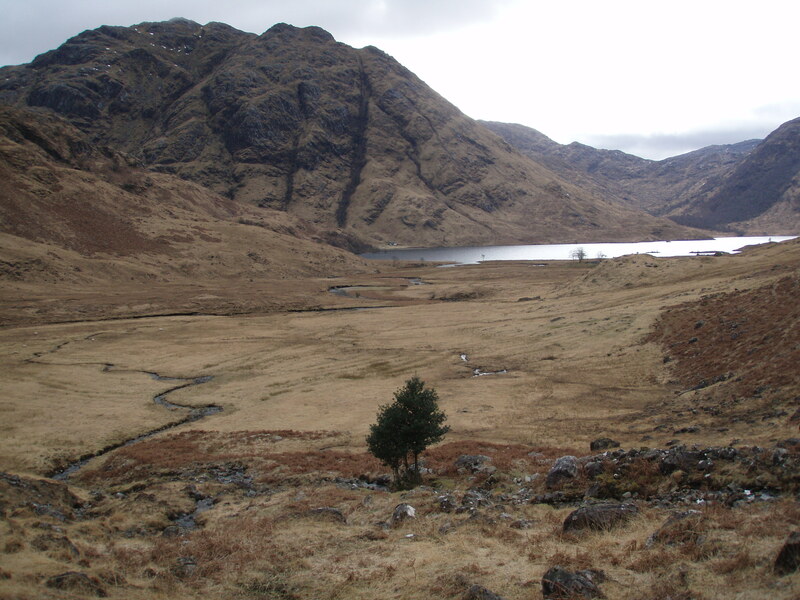 It would be interesting to explore and walk to the end of this path, but this time I had different plans, so I left the path at its highest point and climbed up the “nose” of Druim Chuilinn. 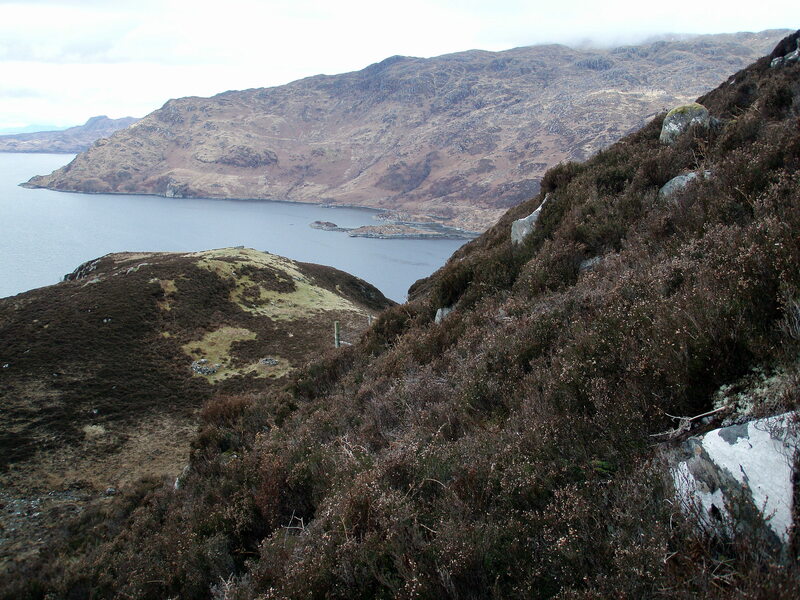 Looking down to Tarbet Bay. 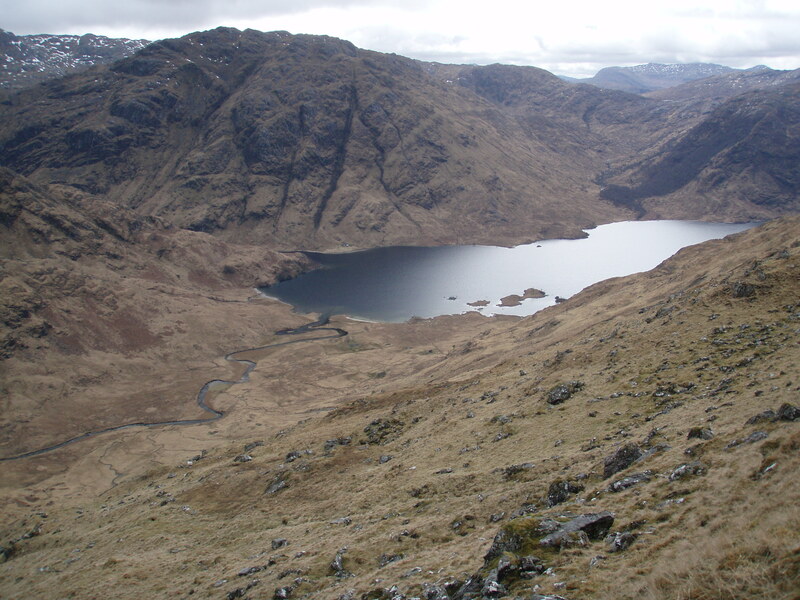 After reaching Druim Chuilinn’s flat shoulder the ascent becomes hard work, as the slopes are very steep and covered with knee-high heather. 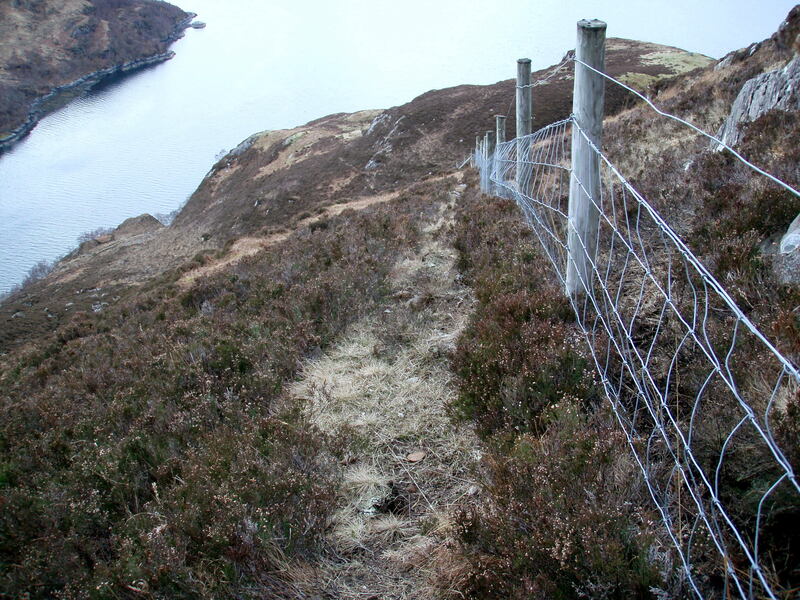 When I arrived at a metal stile, I noticed that there was a path of sorts directly beside the fence leading straight up the hill, it might have been a slightly easier way up following this path! 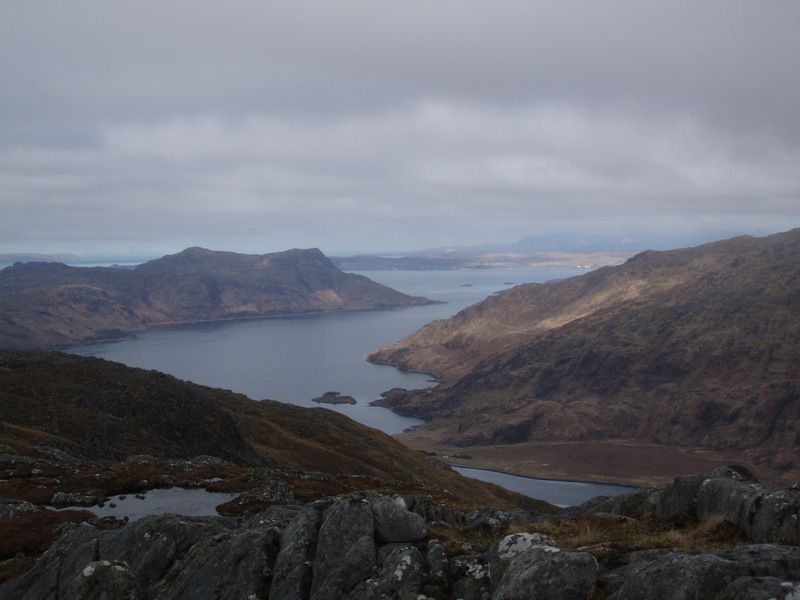 But the views across Knoydart and over the Sound of Sleat to Skye were well worth the effort. 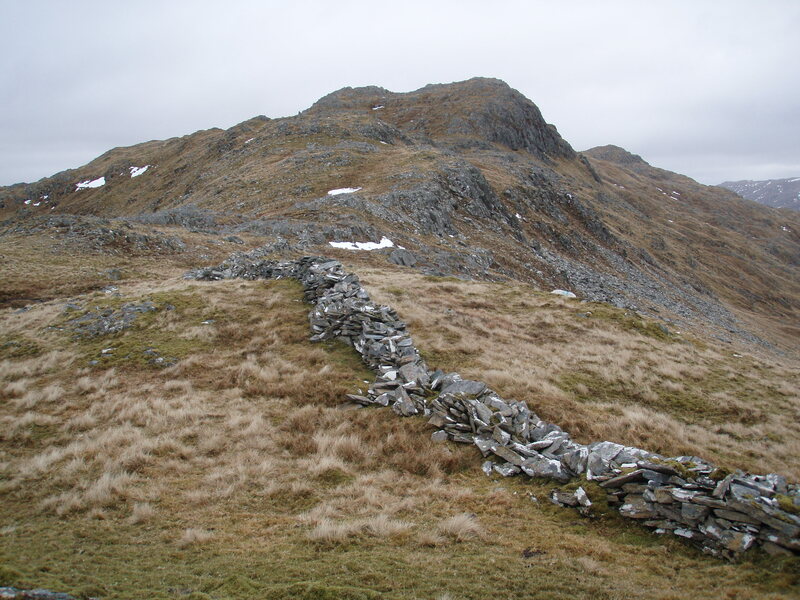 Finally I reached the wide ridge. 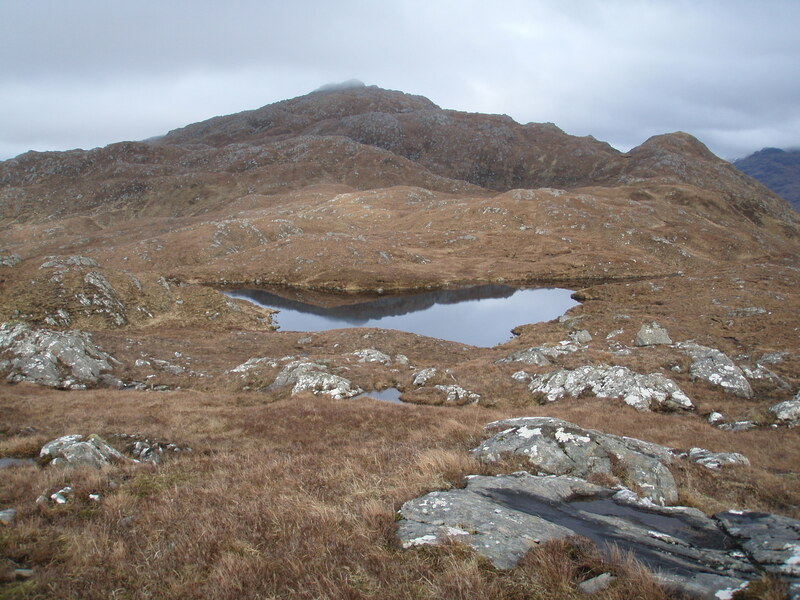 On this ridge, it is not possible to walk in a straight line, instead I had to zigzag around various obstacles in the shape of lochans, crags and bogholes, which made the distance walked a lot longer than it looks on the map. While I was looking for a camp spot, I was suddenly treated to a fascinating spectacle in the sky. 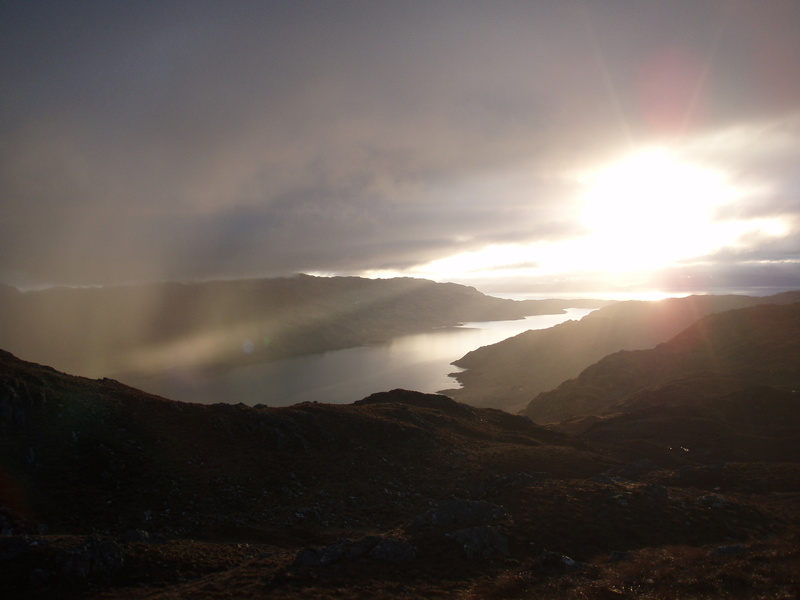 The setting sun had broken through the cloud, at the same time it started to drizzle. 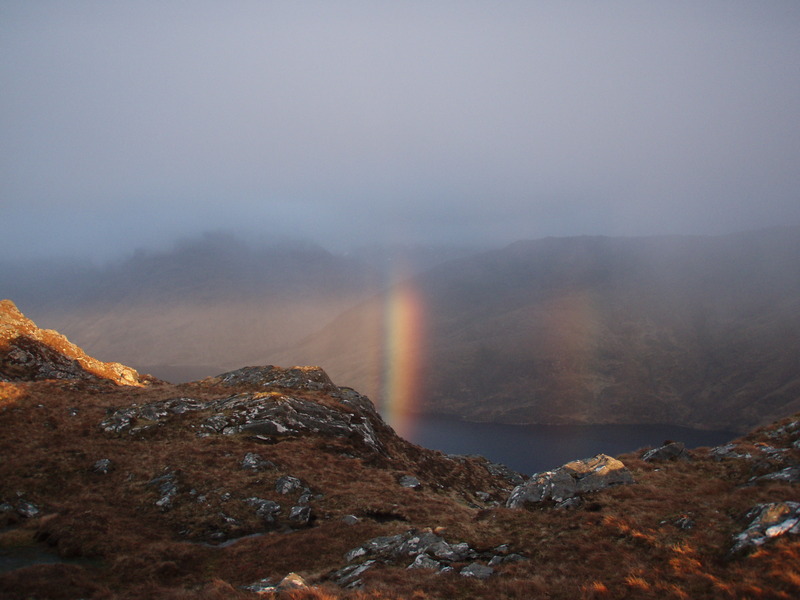 A vertical rainbow appeared over Loch Morar. 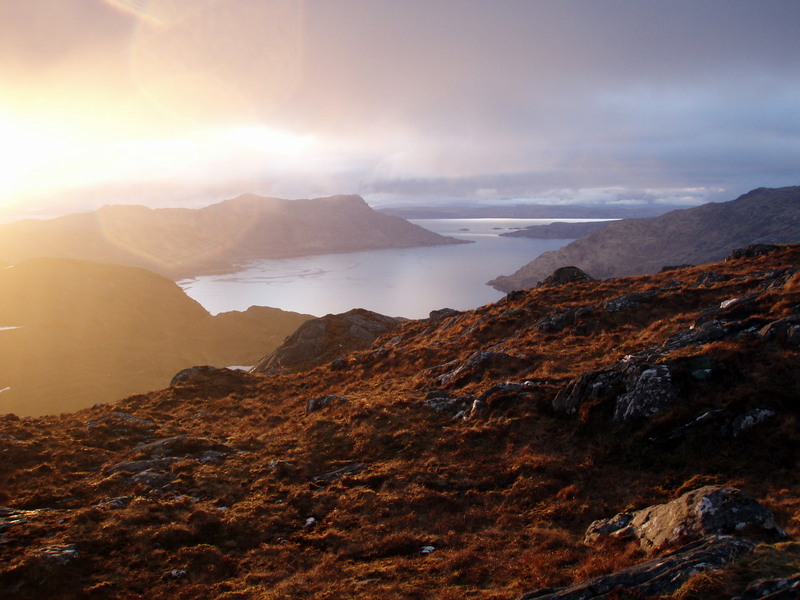 The low sun made everything glow in shades of red, I just couldn’t take my eyes off the views and colours that were changing every few seconds. 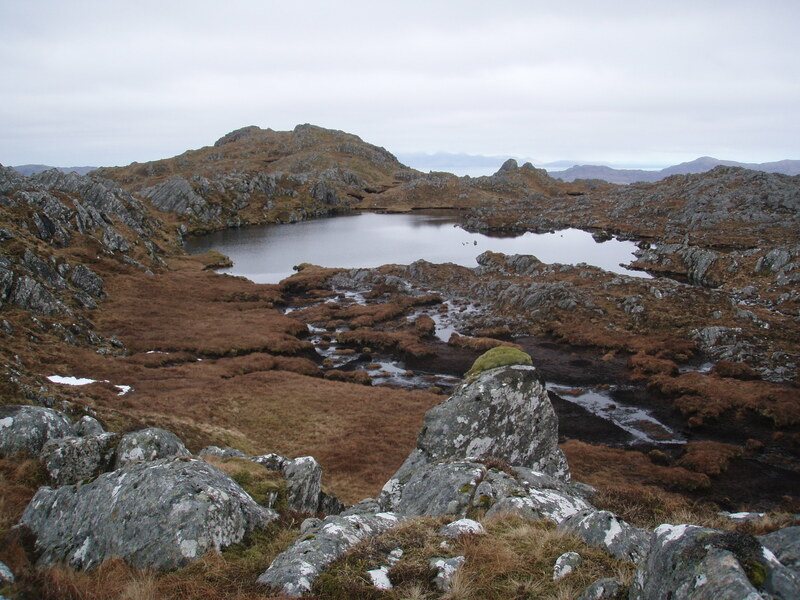 At last I found a tiny pitch for my tent a few hundred metres before the summit of Sgùrr Mòr, between some rocks and on a bit of ground that wasn’t too boggy. 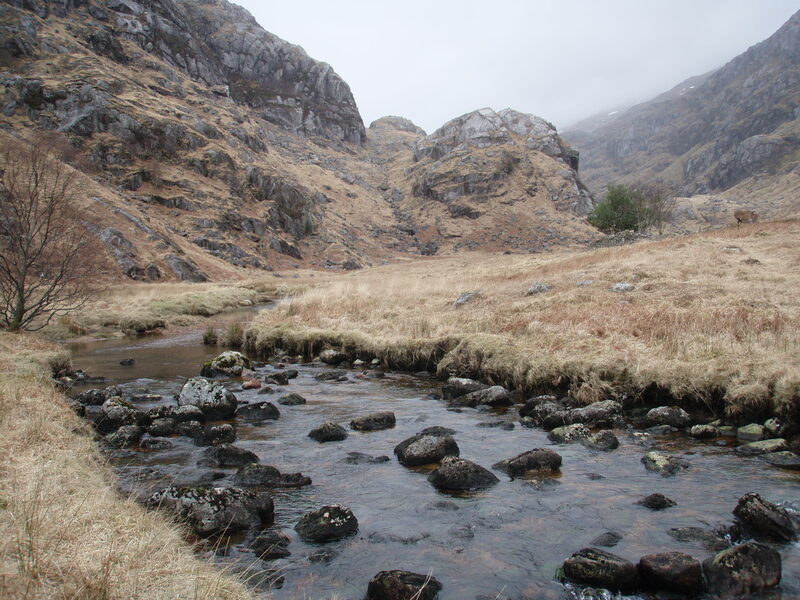 The nearest water source was quite a distance away, but the views from my camp site were worth it. 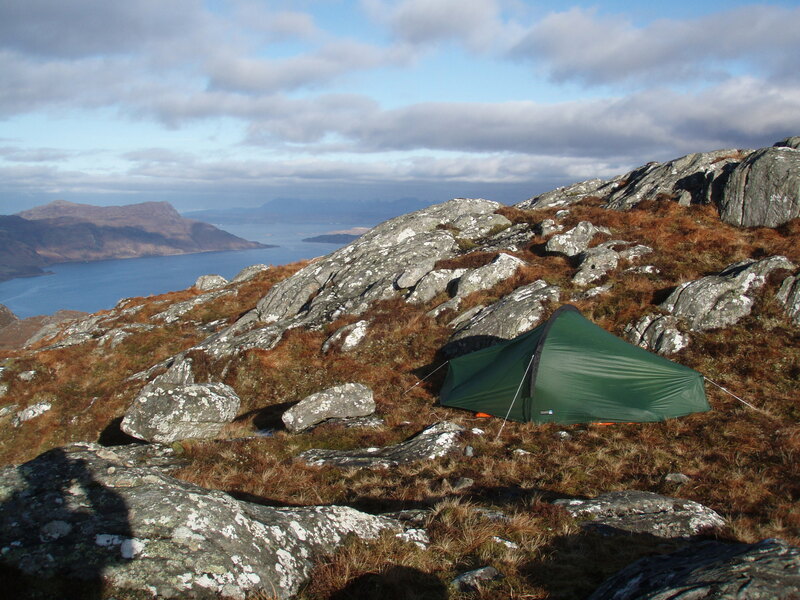 The next morning started even better, the views were fantastic and it was still very warm in the sun, although the wind had picked up a little bit. 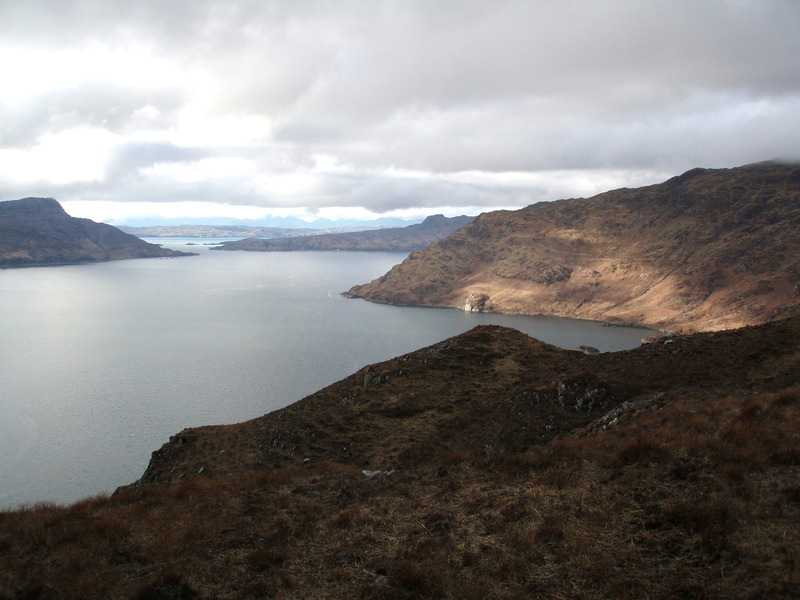 View back along the ridge I had ascended the day before, with Loch Morar to the left and Loch Nevis to the right. 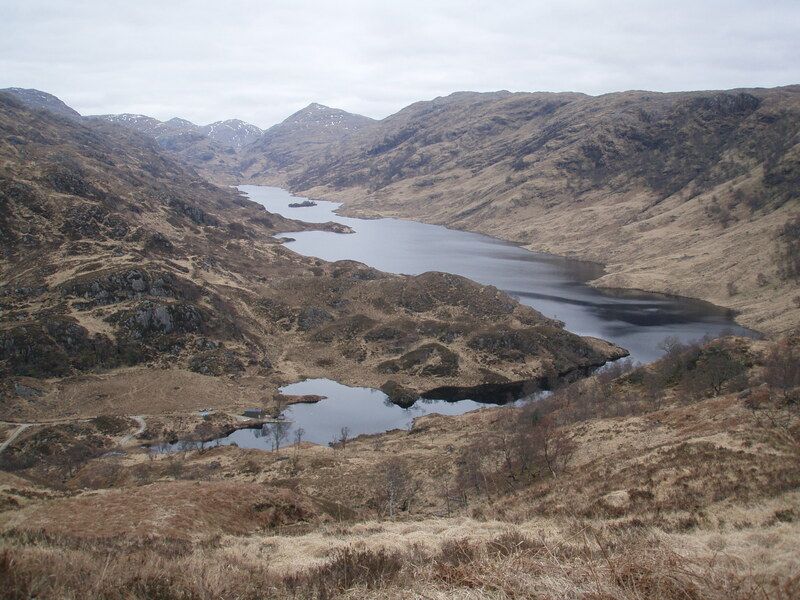 After packing up my tent, I made my way towards Sgùrr Mòr. 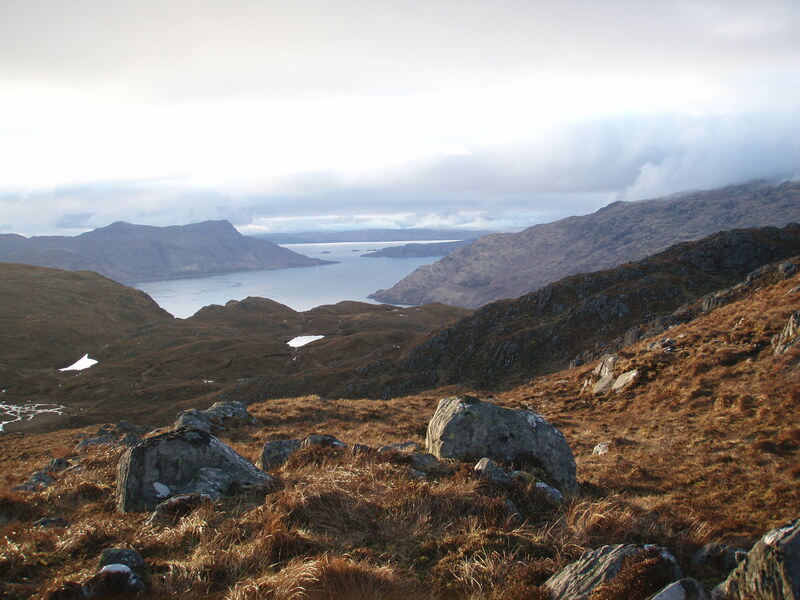 View north west to Knoydart. 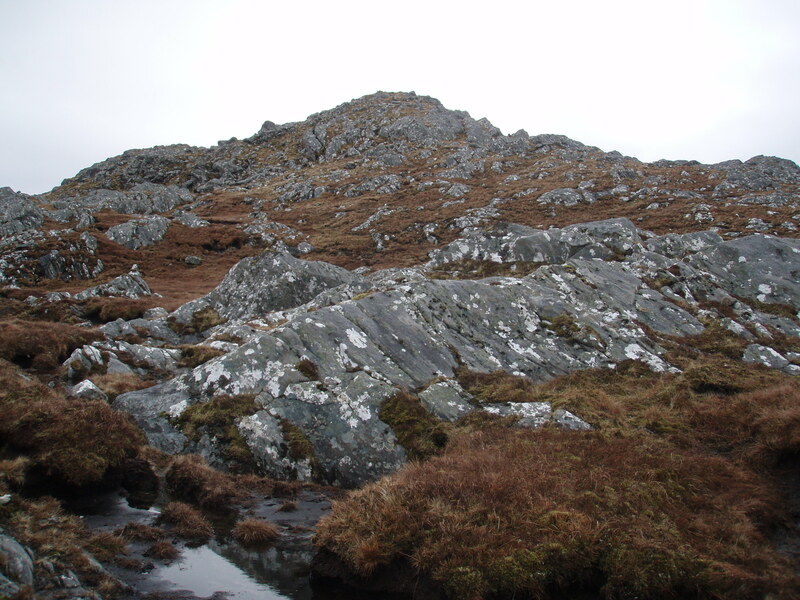 On my way to the next top, Sgùrr Breac, I came across some areas of flat ground covered in soft, dry moss – much better camp spots than my one from last night…! 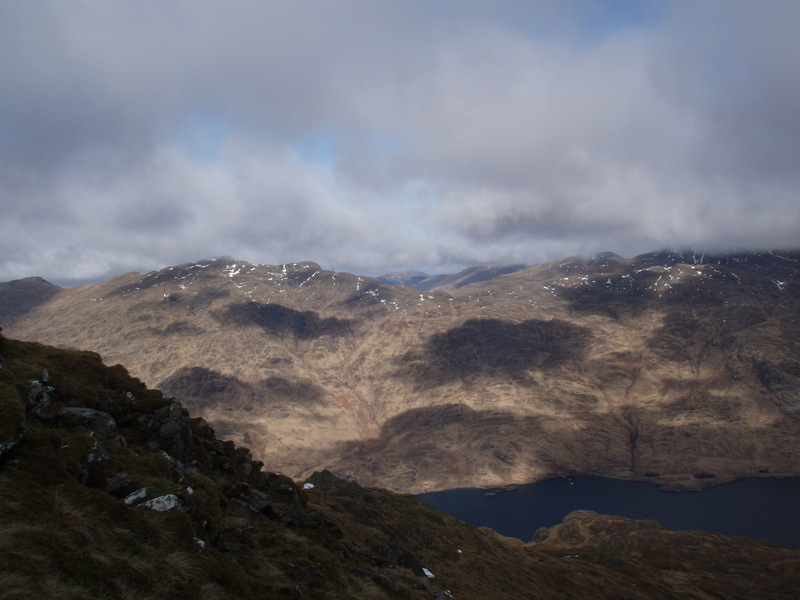 Sunlight and shadows over the Beinn Bhuidhe/Meall Bhasiter ridge. 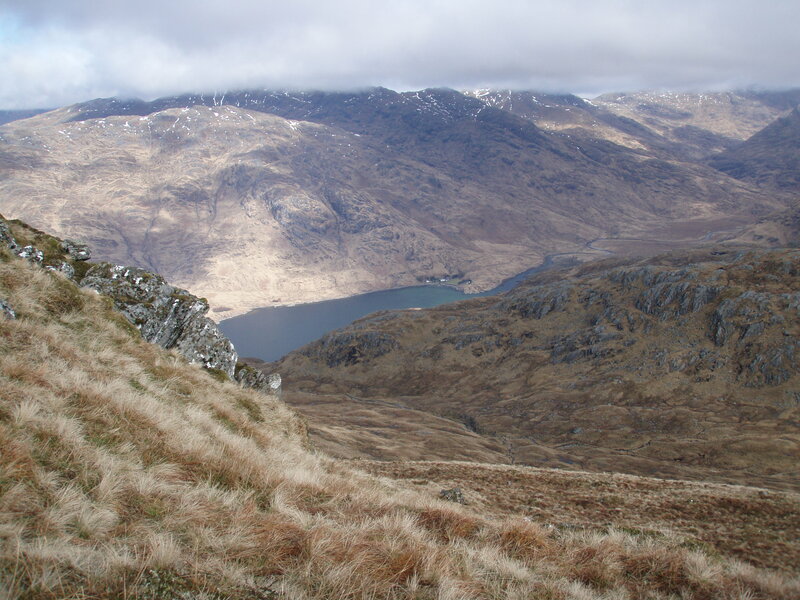 Looking down to Camusrory at the east end of Loch Nevis. 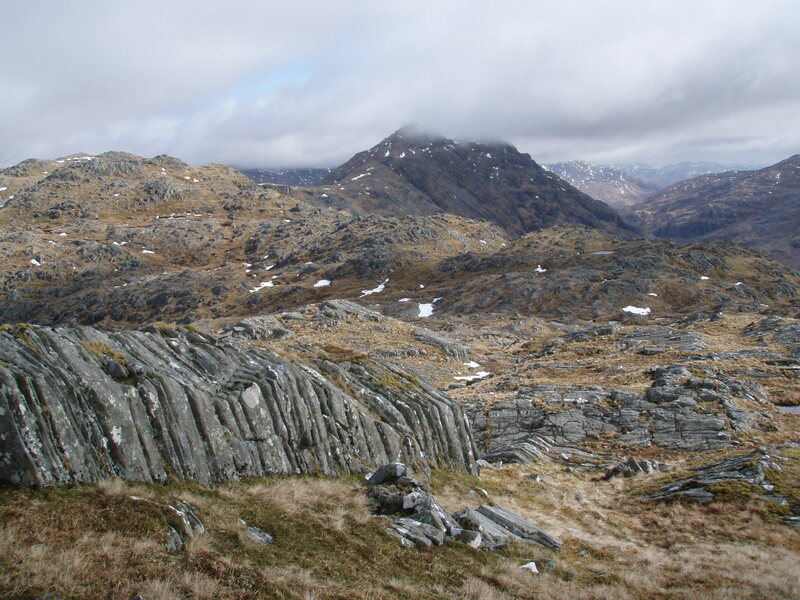 Interesting rock formations on the way to Sgùrr nam Meirleach. 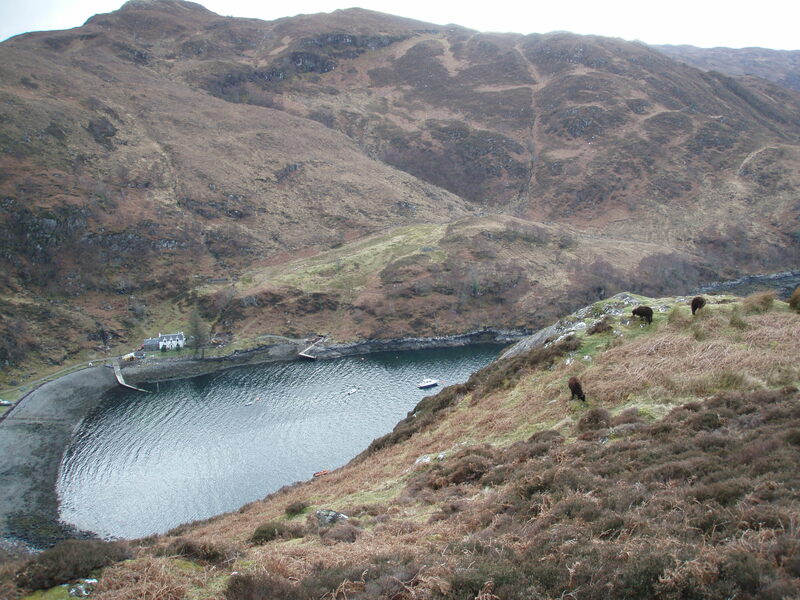 The head of Loch Morar with Oban Bothy just visible right of centre. 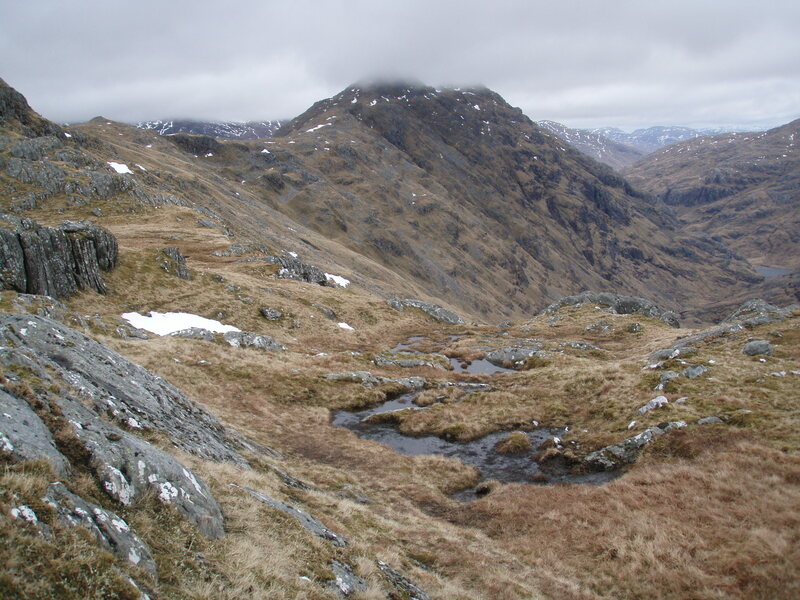 I had planned to descend from the bealach between Sgùrr nam Meirleach and Sgùrr na h-Aide, but from this point on the ridge, just before Sgùrr nam Meirleach, the slopes to the south east didn’t look too steep. 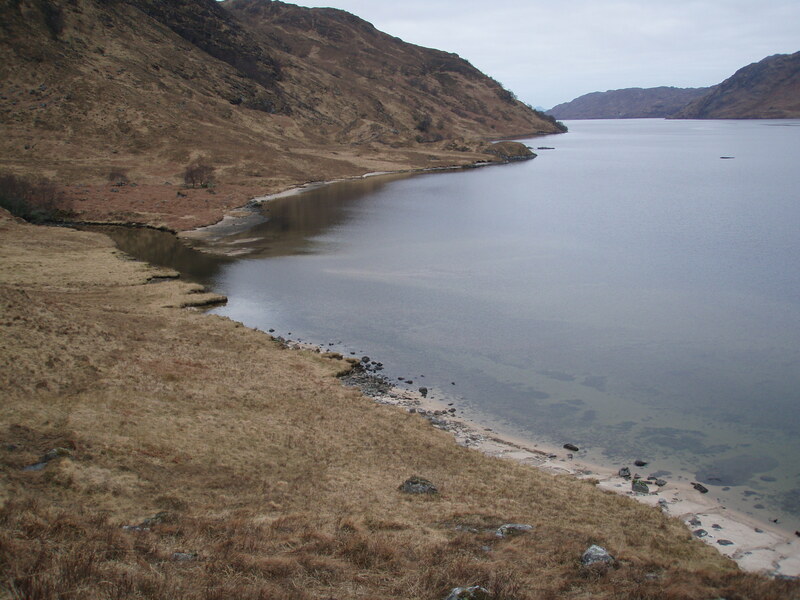 Eastern end of Loch Morar. 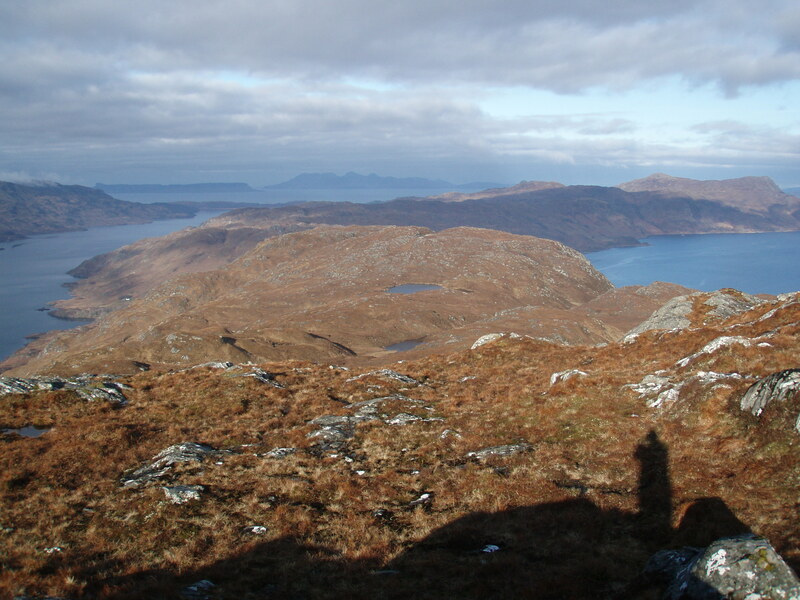 I climbed over the headland Sròn a’ Choin to get to Oban Bothy. 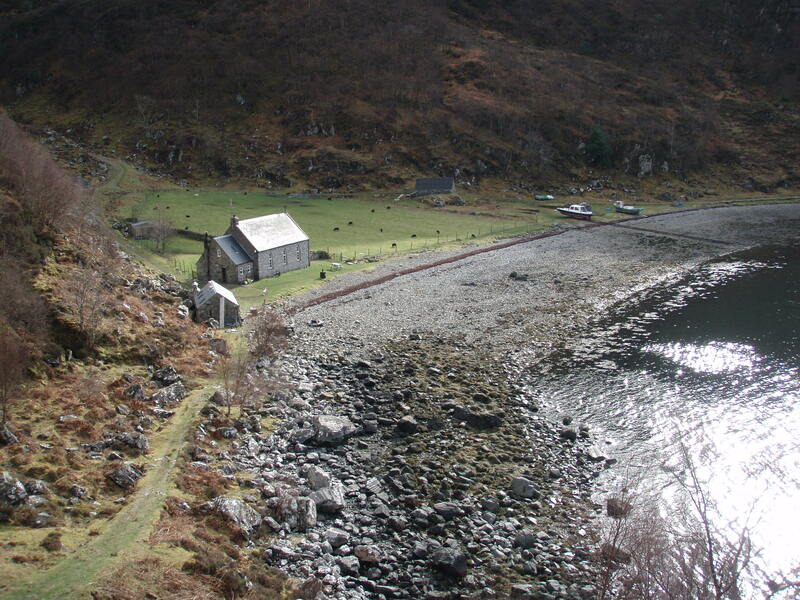 The bothy from Sròn a’ Choin. 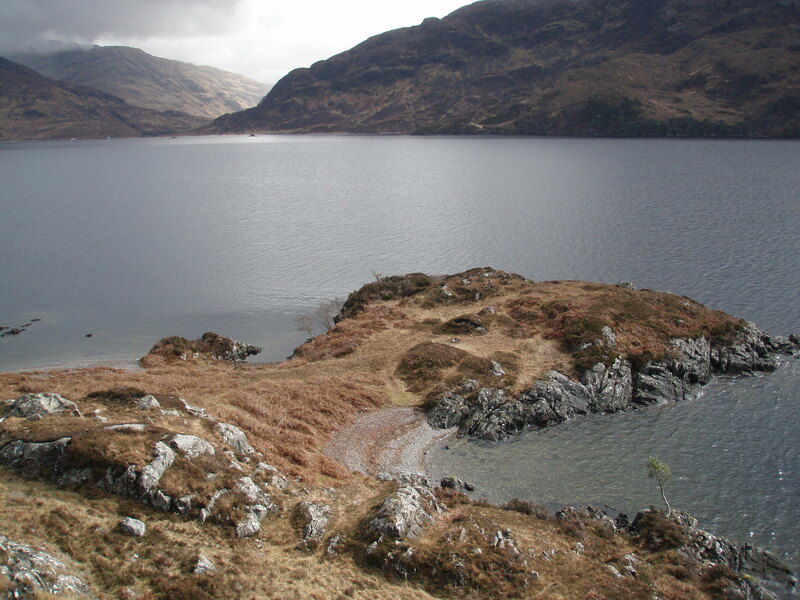 At the east end of the loch, the Allt Gleann an Obain Bhig has to be forded, but there are some stepping stones near the ruined house at the bottom of the glen. 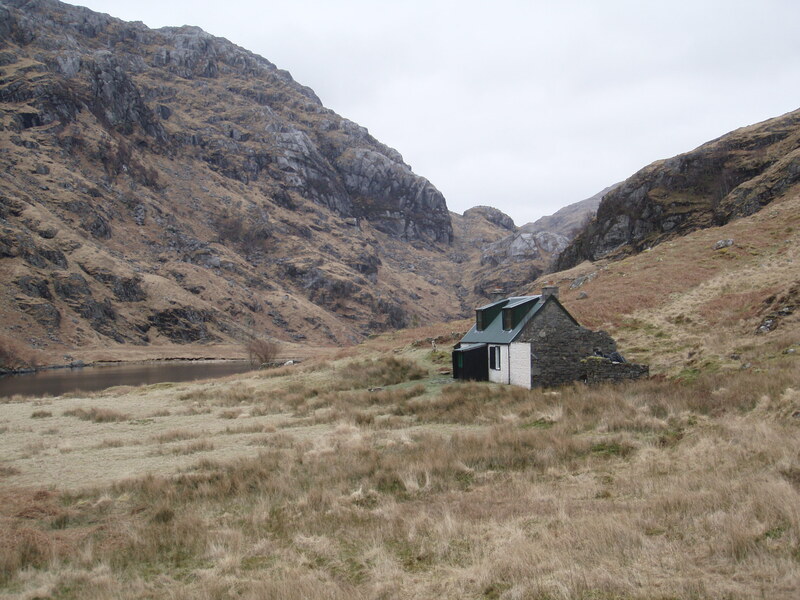 When I arrived at the bothy, I was welcomed by another walker who had been staying there for two days and who had met the kayakers the night before. 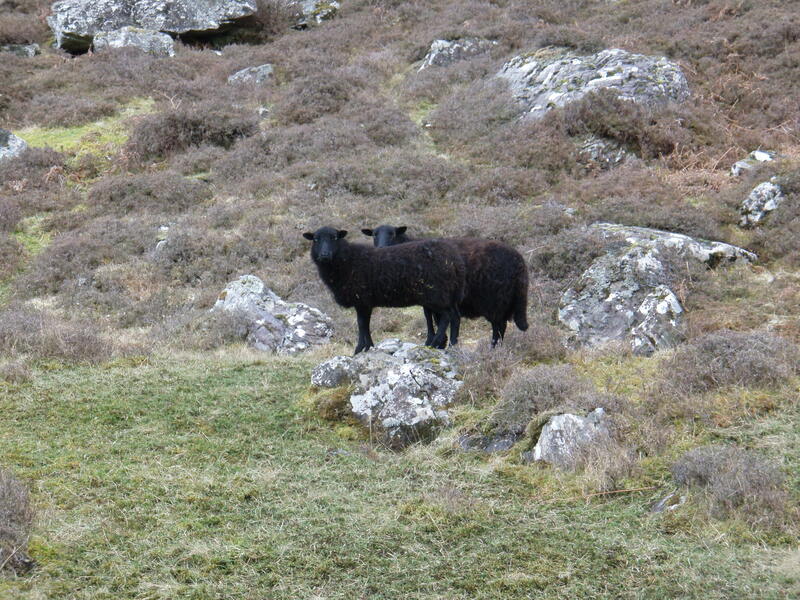 They had left very early in the morning (leaving a large bag of peat briquettes behind). 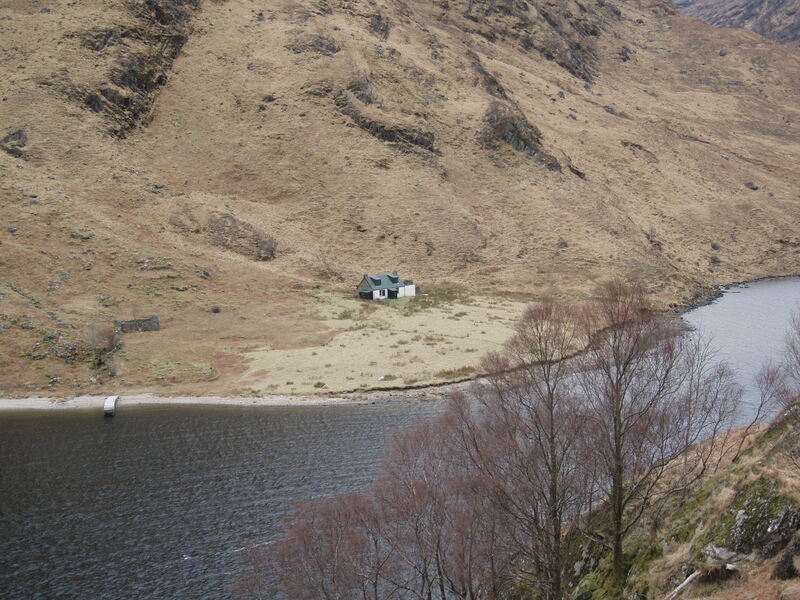 After saying Goodbye to my bothy companion (he was going to leave a bit later as he had not decided yet which way he would walk back to Glenfinnan, where he had left his car), I set off on the lochside path leading into Gleann Taodhail. 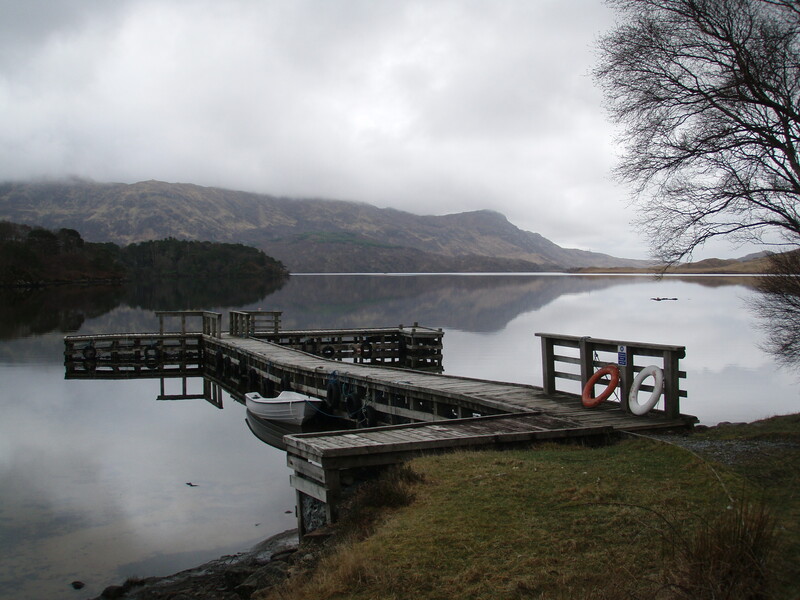 There was no wind at all, and the surface of the loch was like a mirror. 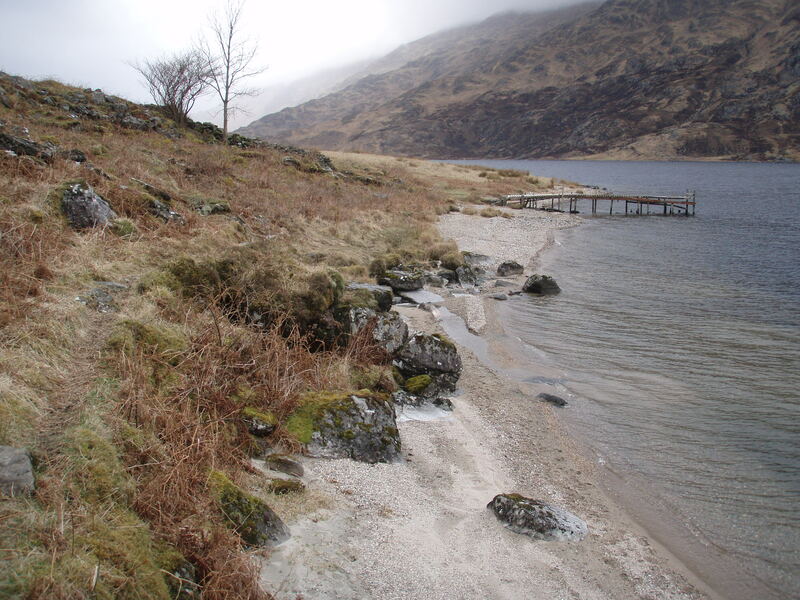 Sandy beaches on the lochside. 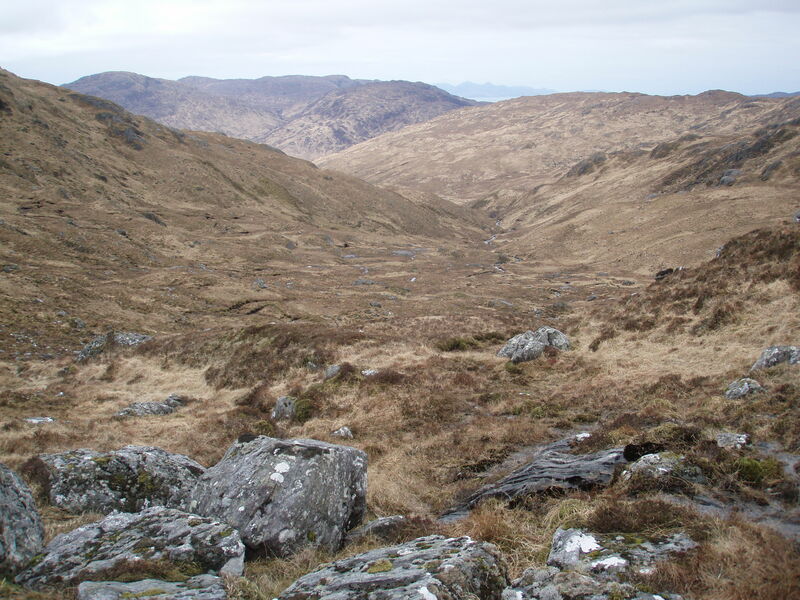 Walking up Gleann Taodhail, I stayed on the path until it turned East into Gleann Cùl an Staca. 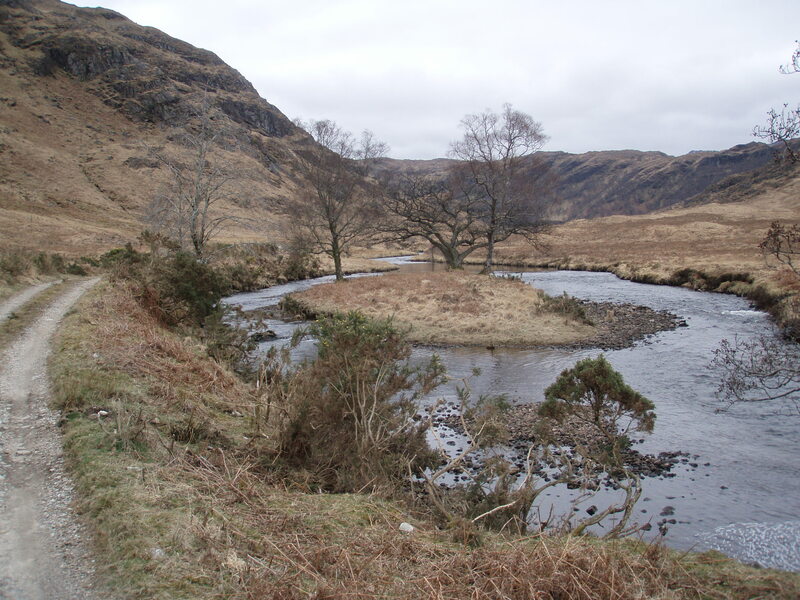 Further down in the glen, the river had been shallow and it would have been easy to ford it. 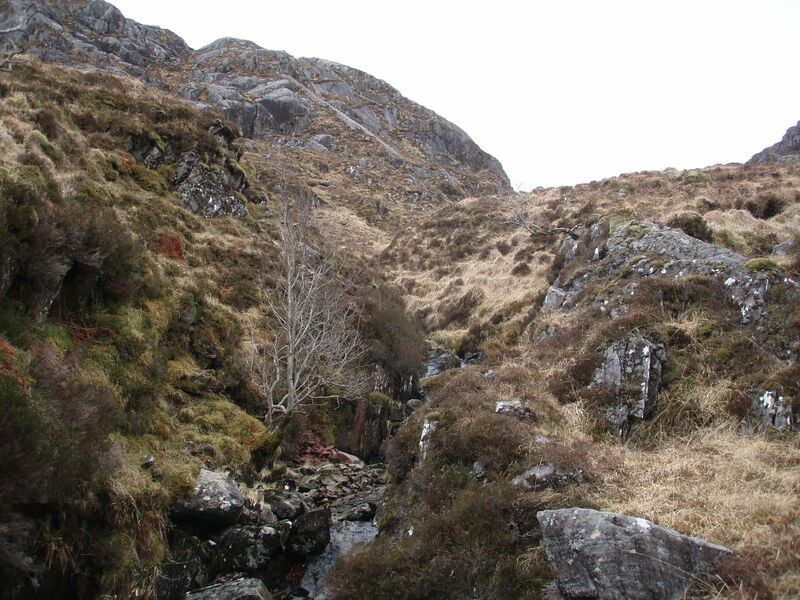 Now I had a bit of a problem because higher up I had to cross one of the tributaries of the Abhainn Taodhail which was flowing in a rocky gorge. 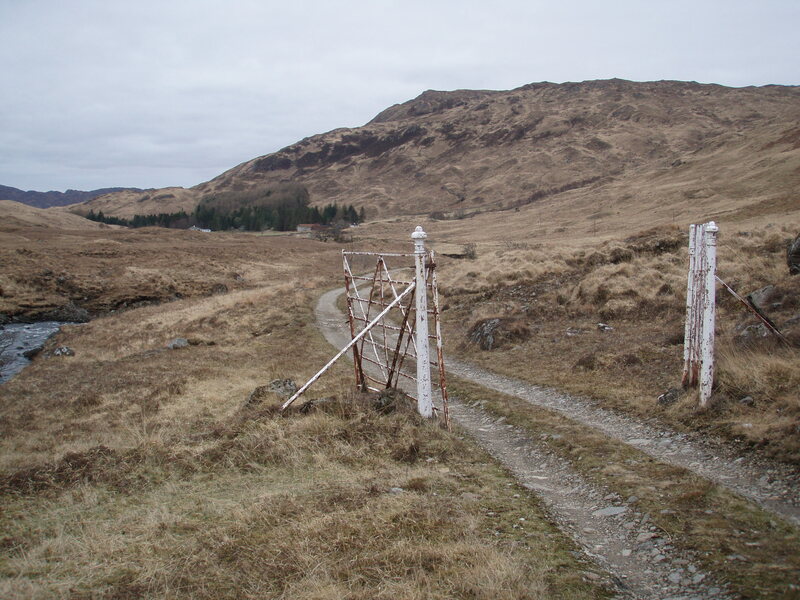 I had to make a long detour uphill until I found a place where it was safe to cross. 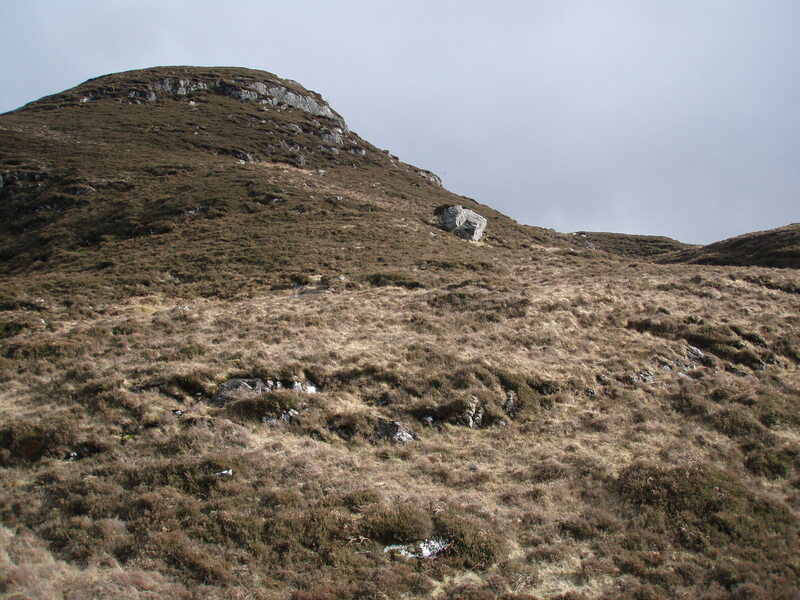 At last I was in the right place again, climbing uphill beside the Abhainn Taodhail. 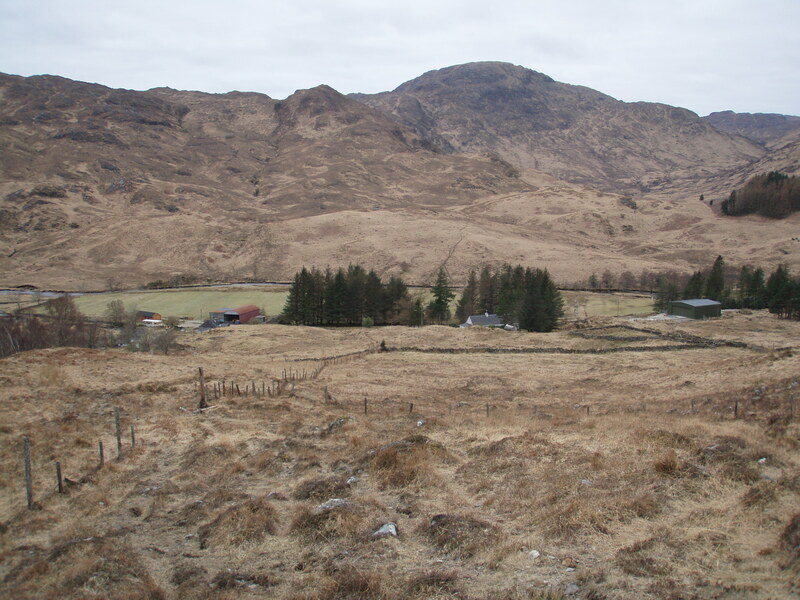 View back along Gleann Taodhail. 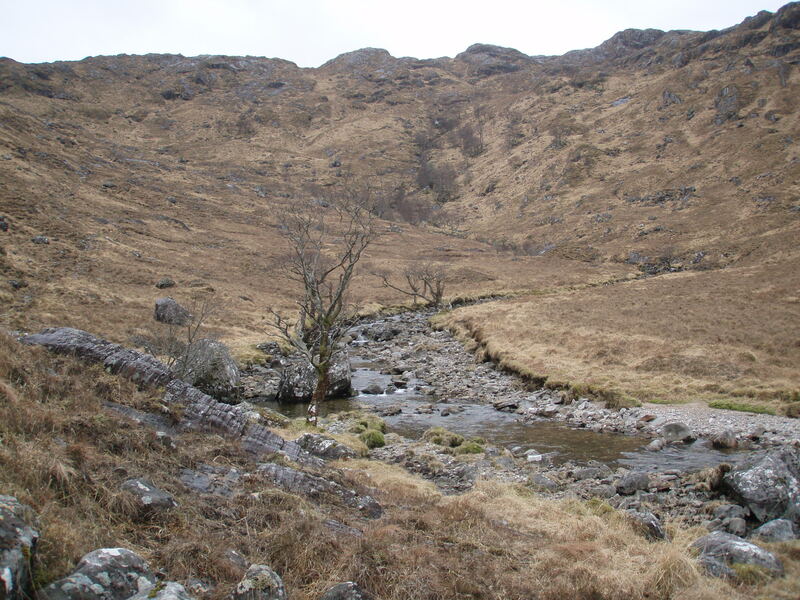 Gleann Cùl an Staca – that’s where I saw my bothy companion for the last time, waving to me from the path and then heading off into the glen. 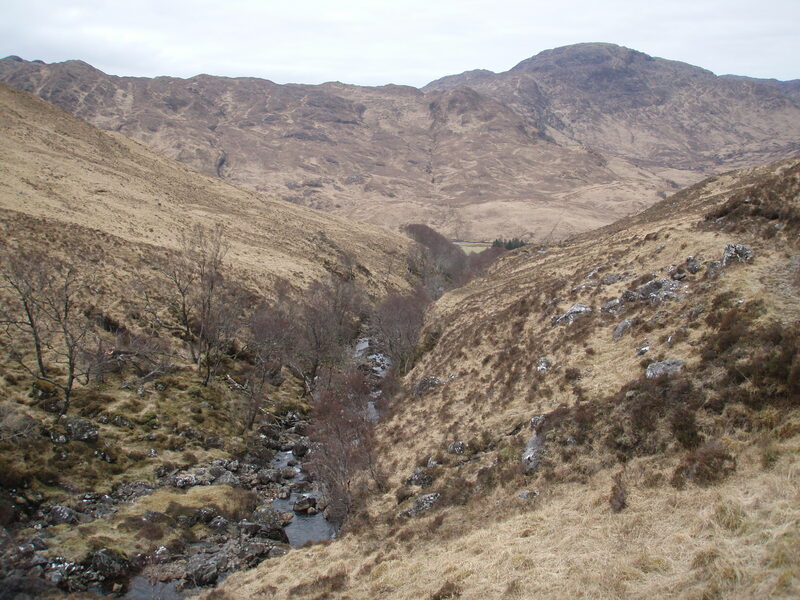 Approaching the bealach, the steepness of the terrain eases a bit. 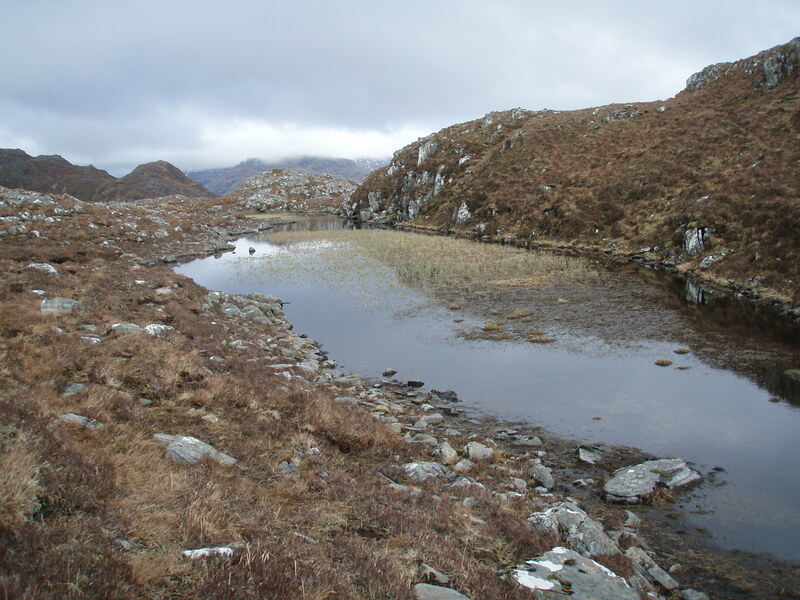 Lochan at the highest point. 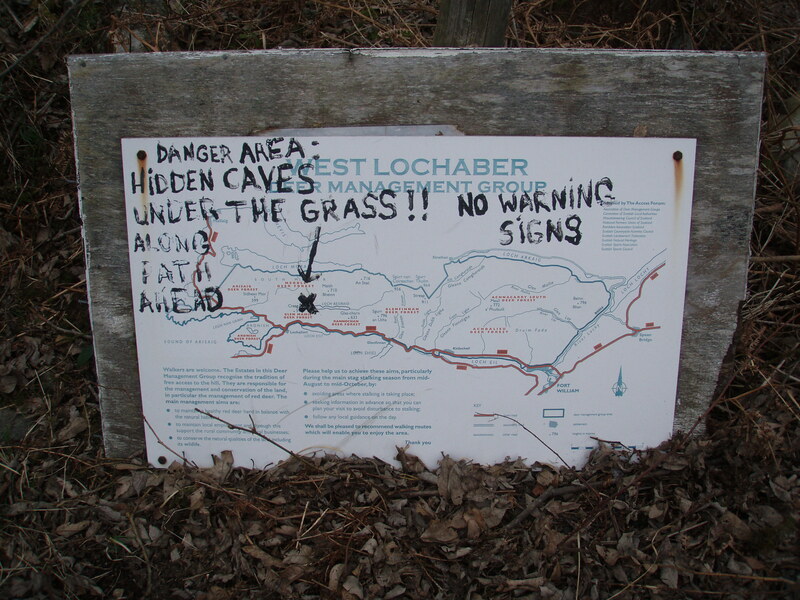 Although there are quite a few buildings, I saw no signs of life. 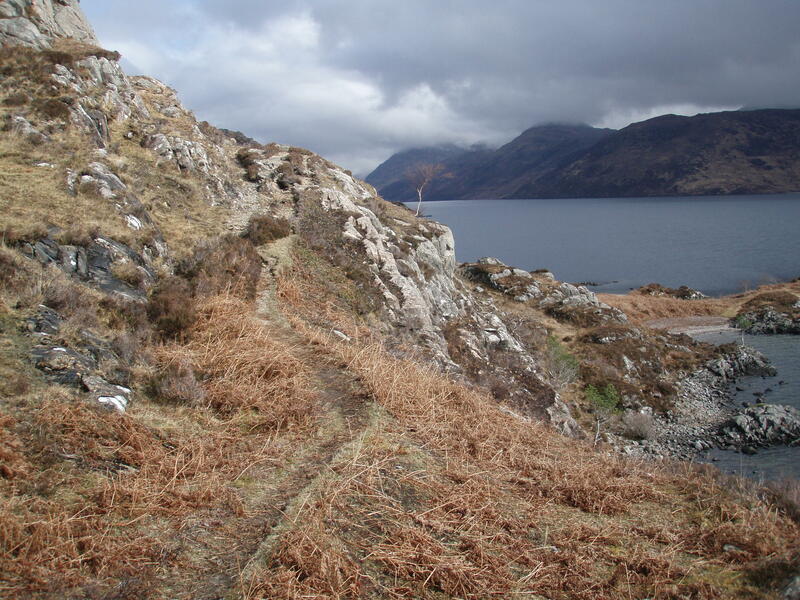 A Landrover track leads along the River Meoble. 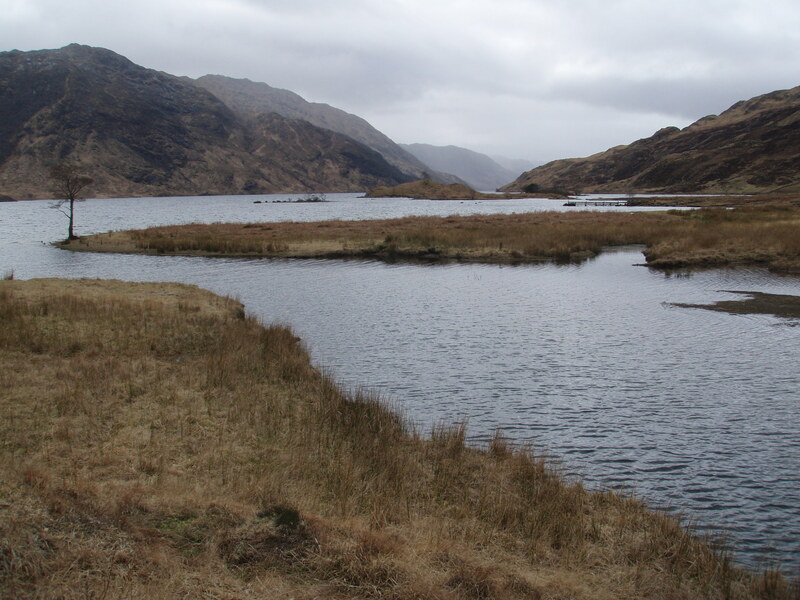 Lochan Lòn a’ Ghairt and Loch Beoraid. 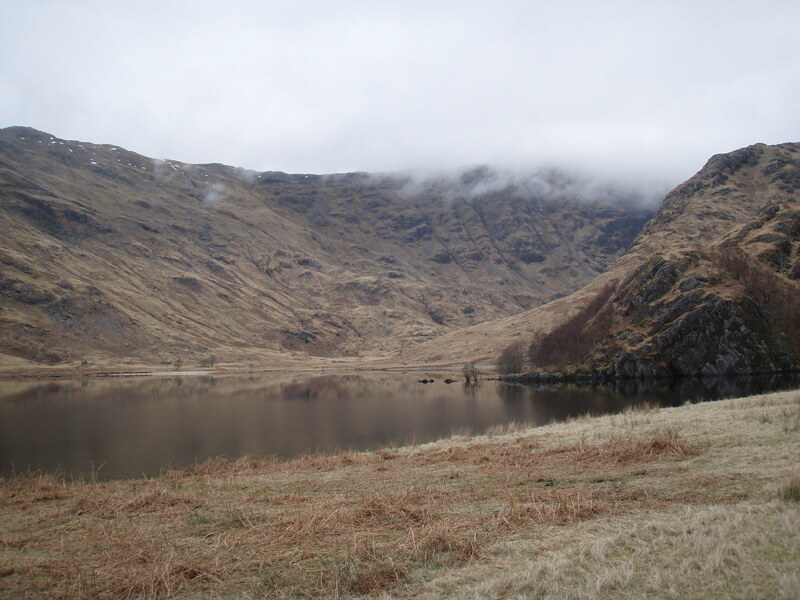 Looking along the length of Loch Beoraid. 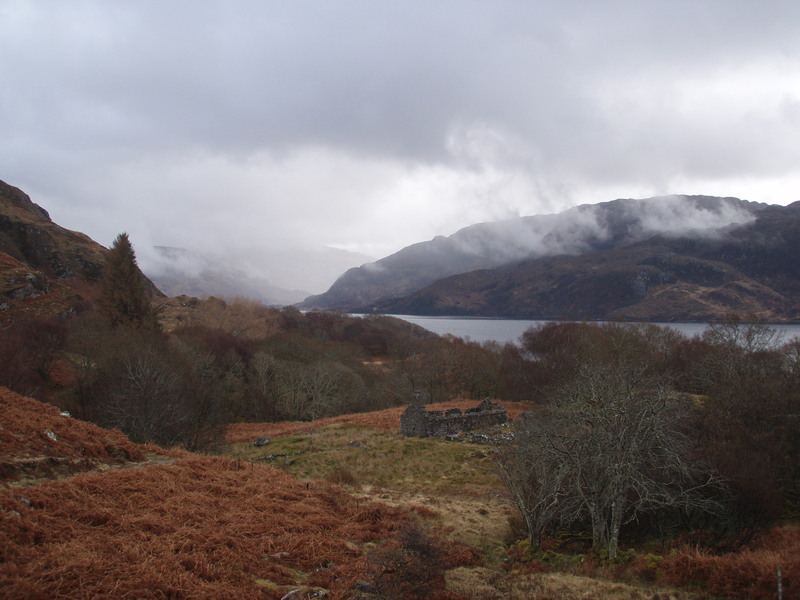 …the scenery becomes a bit bleak. 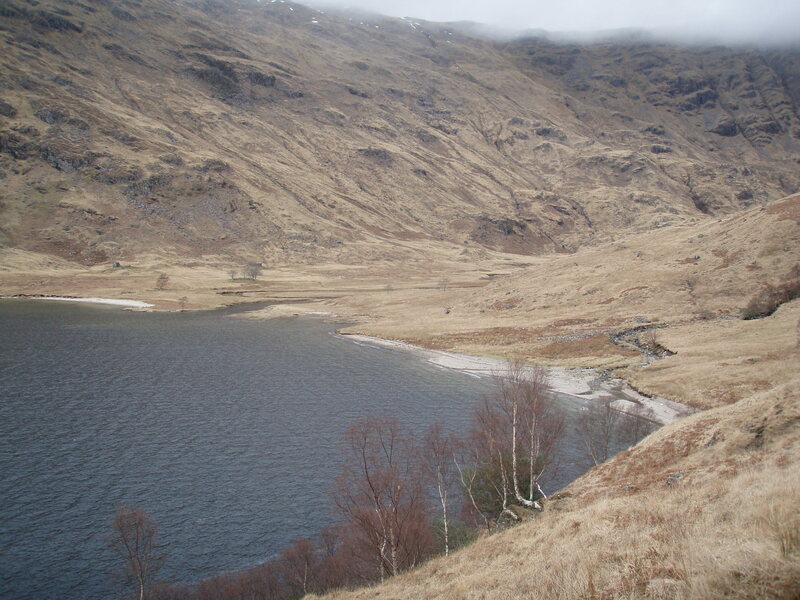 But soon the main road and Lochan Dubh come into sight. 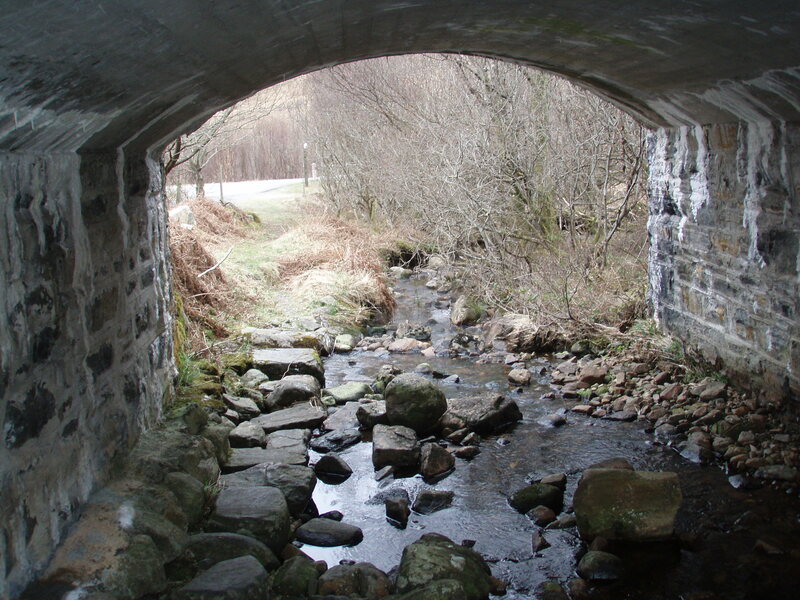 This underpass leads under the railway line to the A 830. 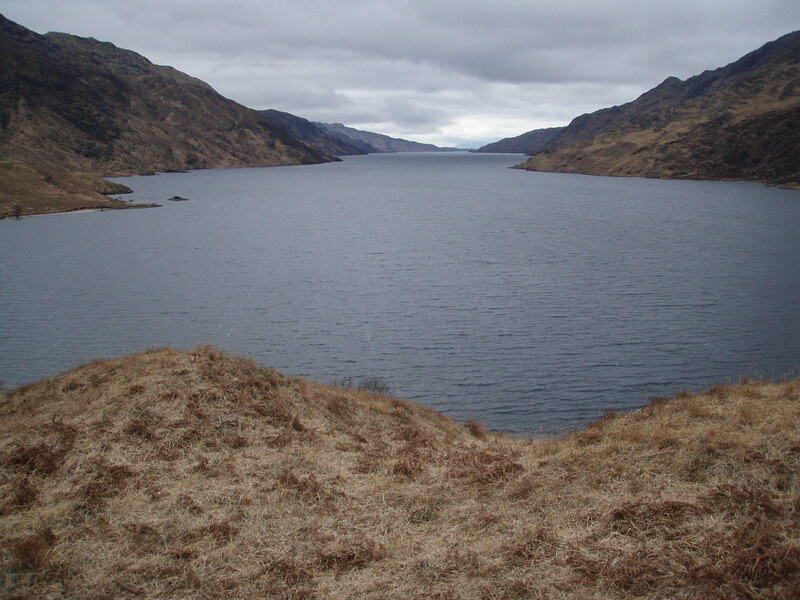 After a short walk along the road to Lochailort I was reunited with my car, and all that was left now was a two hour drive back home. 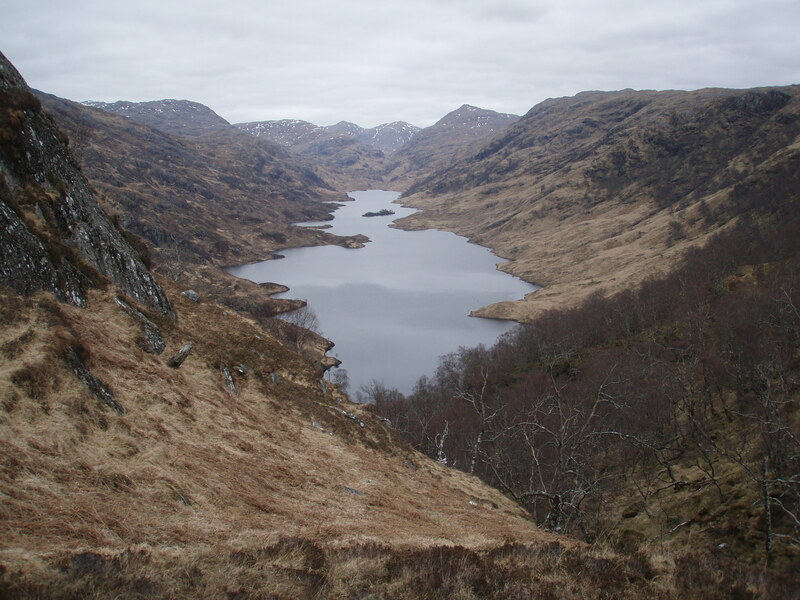 This was my best trip of this year so far, and also my first proper training for the Challenge. 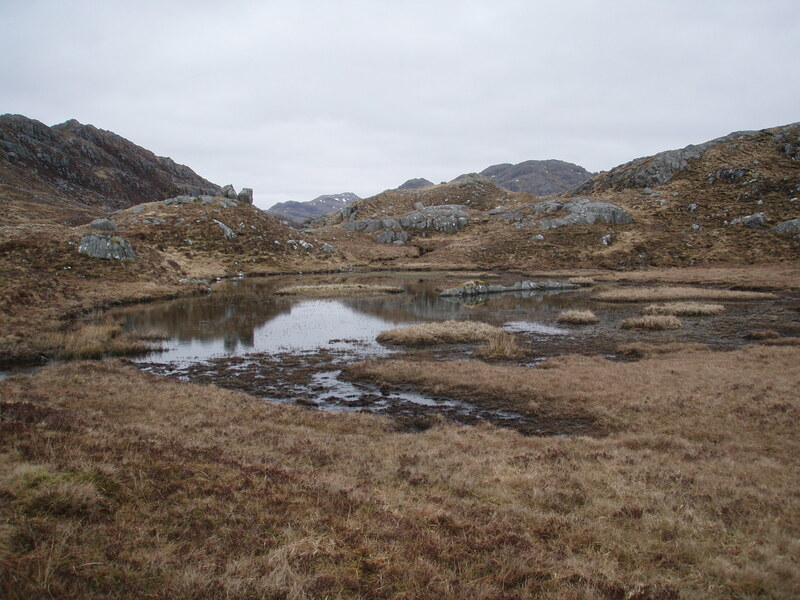 Mainly pathless walking over rough ground, some navigation exercises and a high camp – and as a bonus, great weather 🙂 It can’t get much better! What a great Day 1! 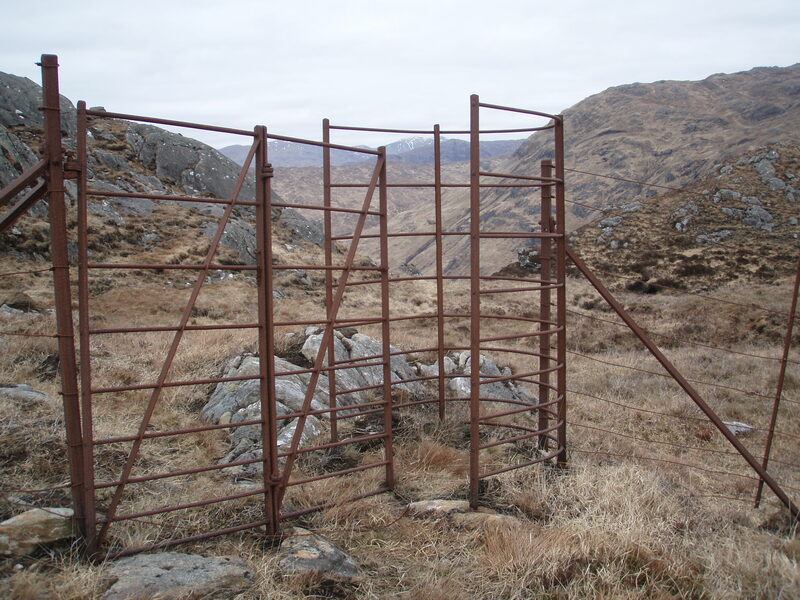 Great post mate. Keep ’em coming. 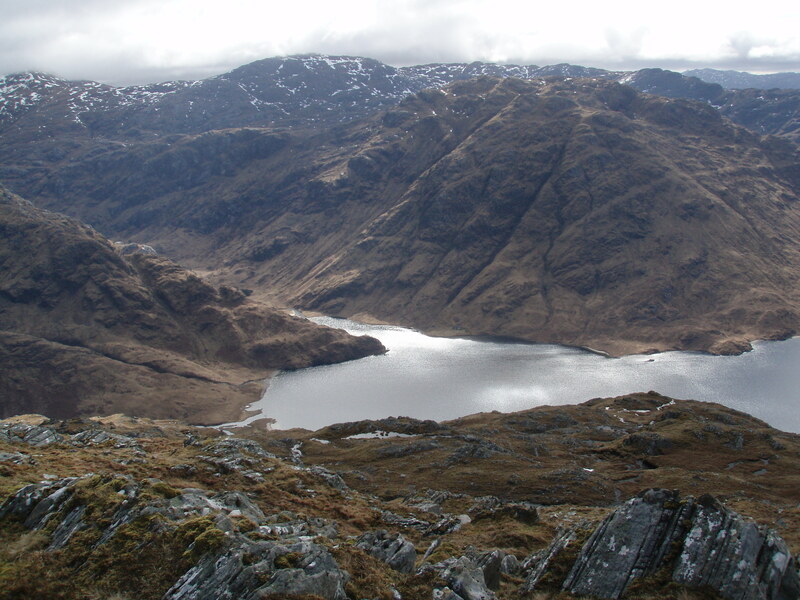 I’ve always wondered what it’s actually like to camp on top of a Munro. Isn’t the omnipresent wind very uncomfortable? 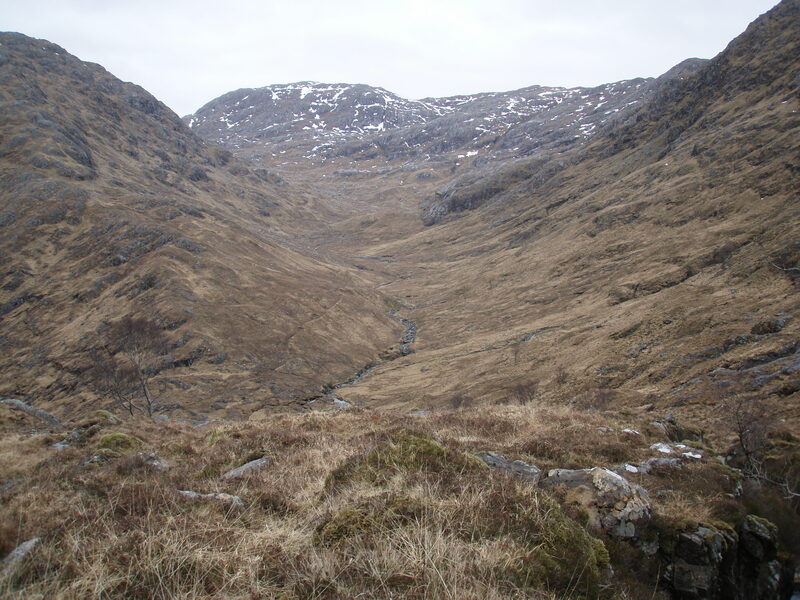 Really interesting account of a long rough journey – and a reminder that people once lived in all these places..